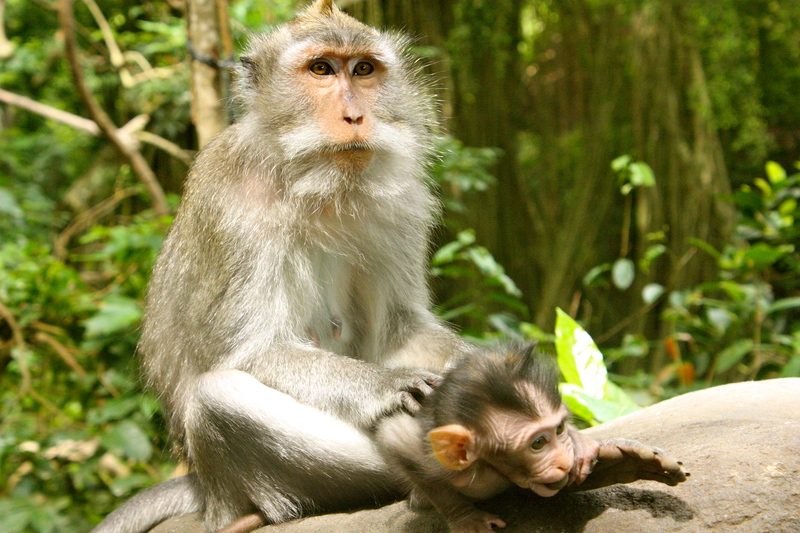 During our time in Bali we decided to hire a driver and see some of the island. Our friends had done this before and highly recommended it and also gave us the name of their driver so we organized to meet him at our hotel. 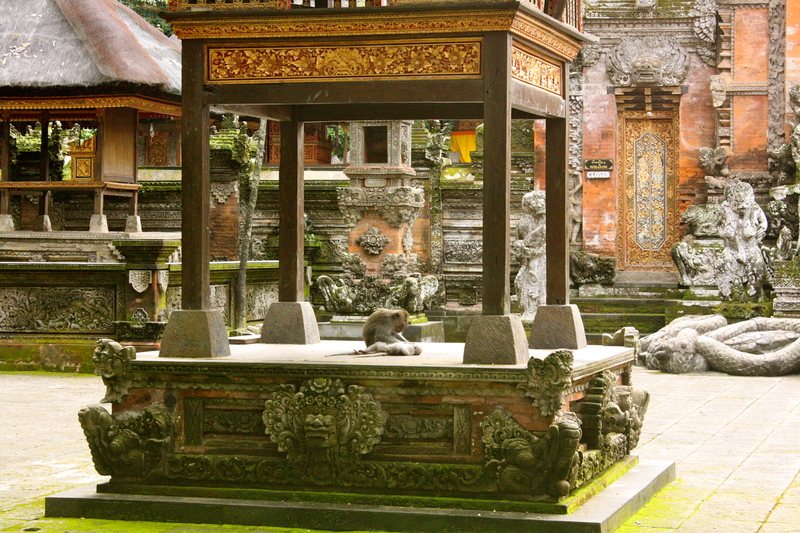 He offered many different types of tours but the one that stuck out for us was getting to go up north and see Bedugul which has a beautiful temple on a lake. His name is Gejor and we quickly found out that he is a really great, friendly person! 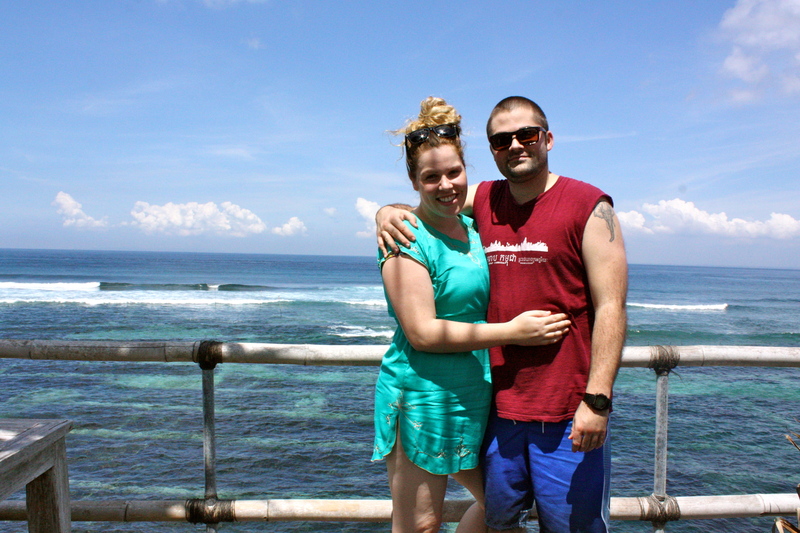 He picked us up from our hotel at 9:30 and we started driving to our first stop of the day, Tanah Lot. On our way, while chatting, we mentioned that we were interested in buying some art but were worried that it would be very expensive. 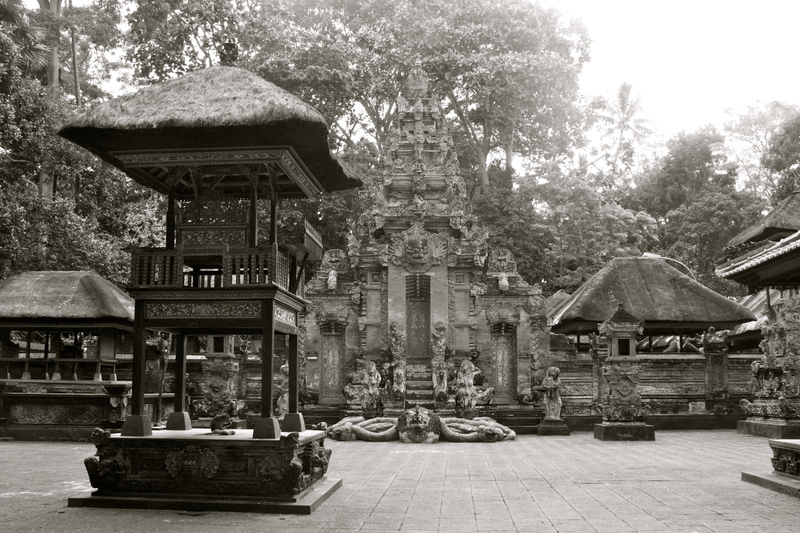 He then offered to bring us to a gallery outside of Ubud to take a look. When we arrived, we started walking around with one of the men working there and realised that the place was huge! They had thousands of paintings! When we finally finished walking around we realised that we had forgotten where our favourites were so had to return and try to decide together. In the end we bought two beautiful paintings for about $60 combined. We were both very happy with them and know that they will hang proudly in whatever future house we end up living in. 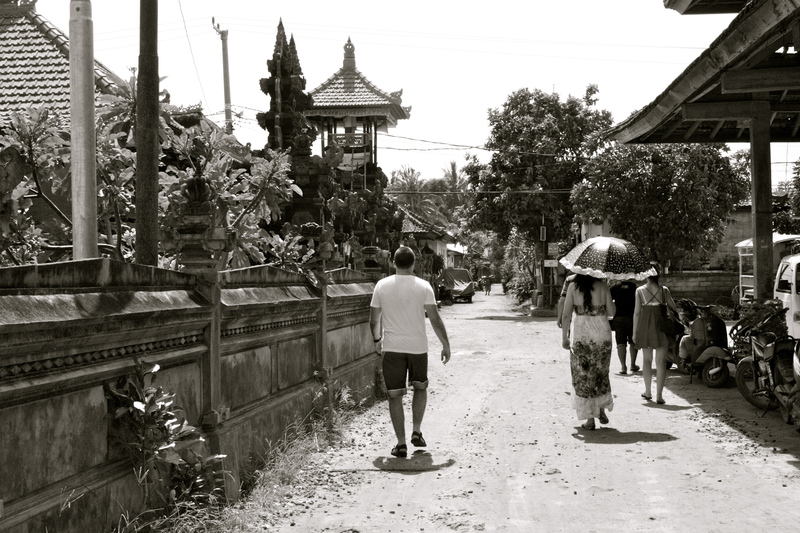 After that surprise stop we continued on to Tanah Lot. 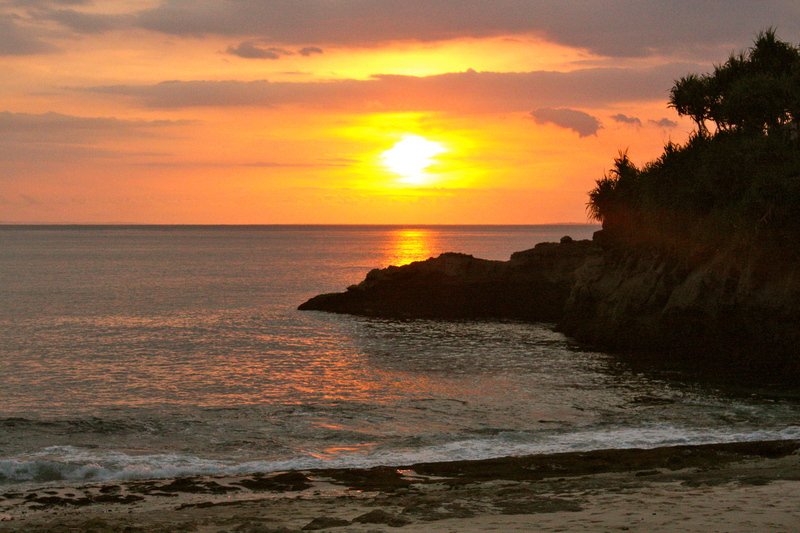 Tanah Lot is probably the most famous of Bali’s temples. 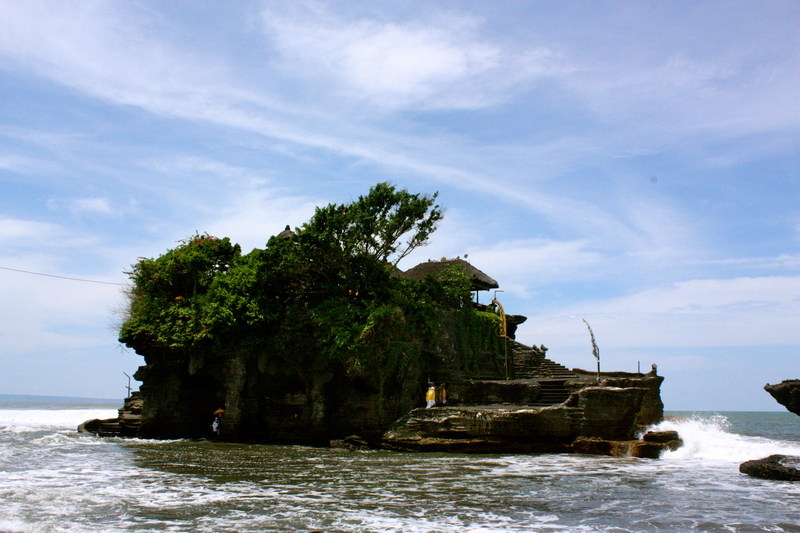 It is a beautiful temple that was built on some rocks just off of the beach. When it’s low tide people can walk out to it. It is very beautiful but it was extremely crowded. I can’t imagine what it’s like during the busy season! After getting a few photos at Tanah Lot, it was back in to the car for the hour journey up north to the Jatiluwih Rice Terraces. This was probably my favourite stop of the day. 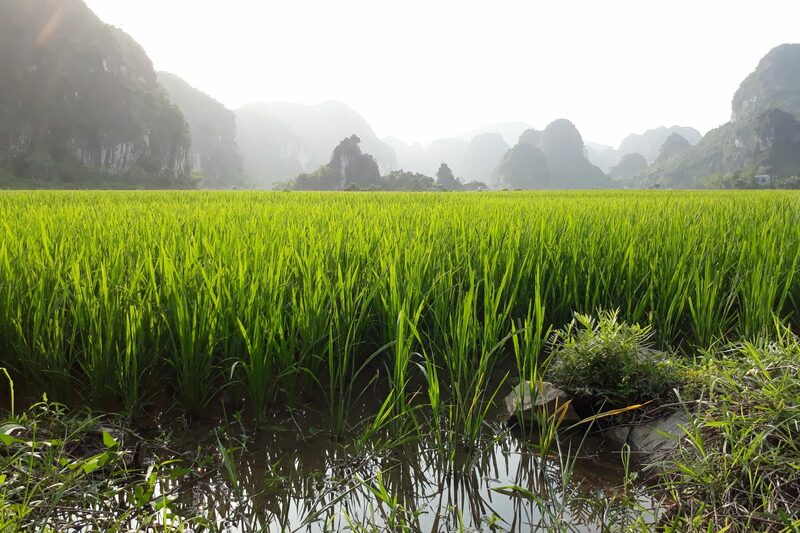 It was absolutely stunning there and there were rice paddies in every direction as far as the eye could see! I could have spent forever there just taking in the beauty of it all! We did stop here for lunch and got to get a table with a view. 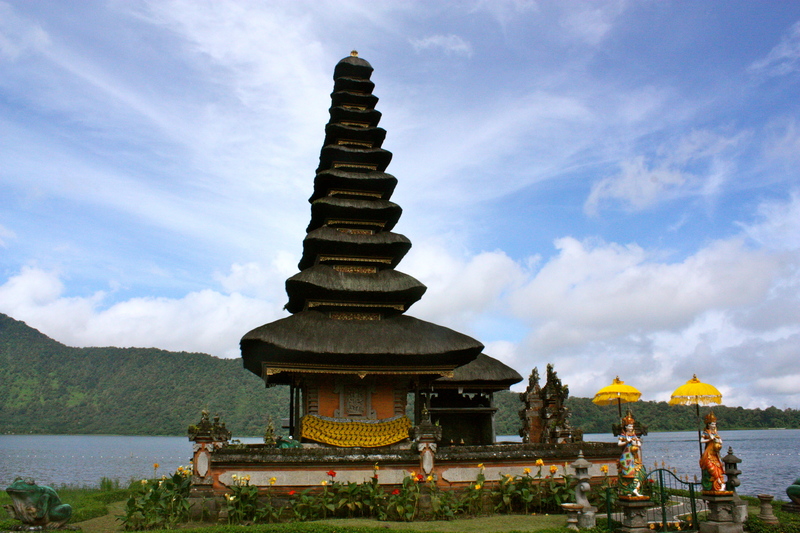 After lunch we were on our way to Bedugul to see the famous Ulun Danu temple. 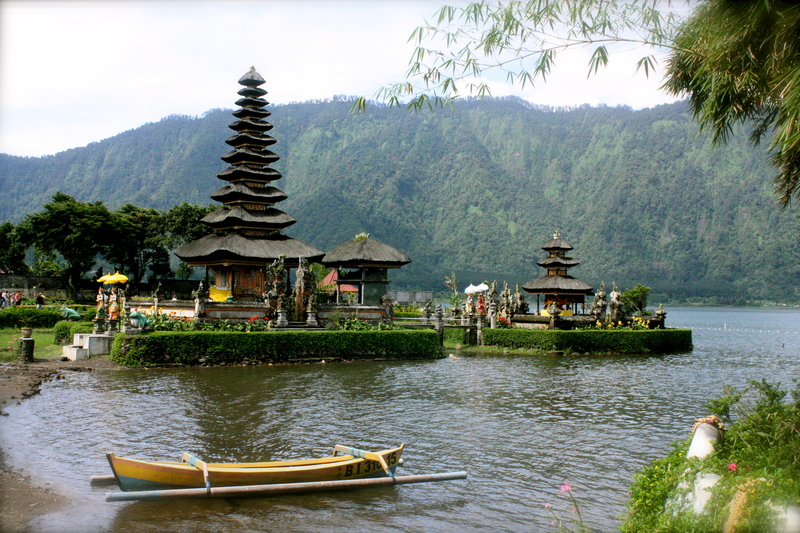 The Ulun Danu temple is such a beautiful temple. But what makes it even more beautiful is its surroundings. 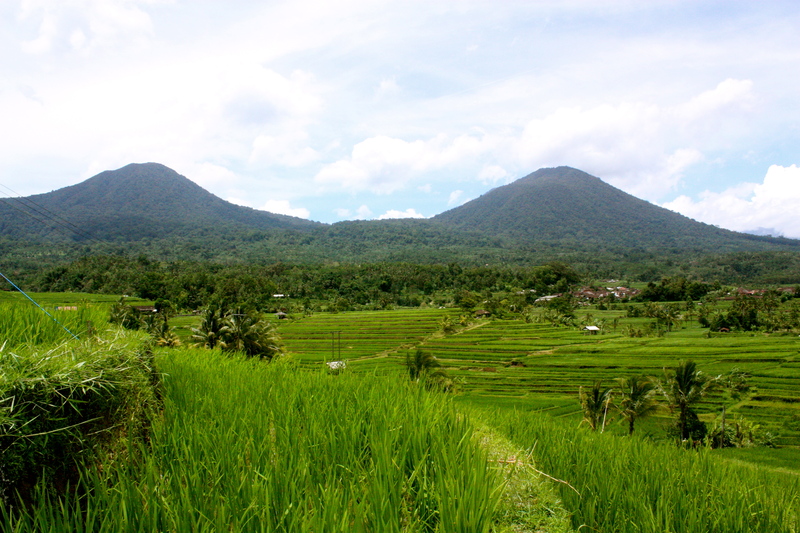 It has a huge mountain as a backdrop and it sits on a serene lake. 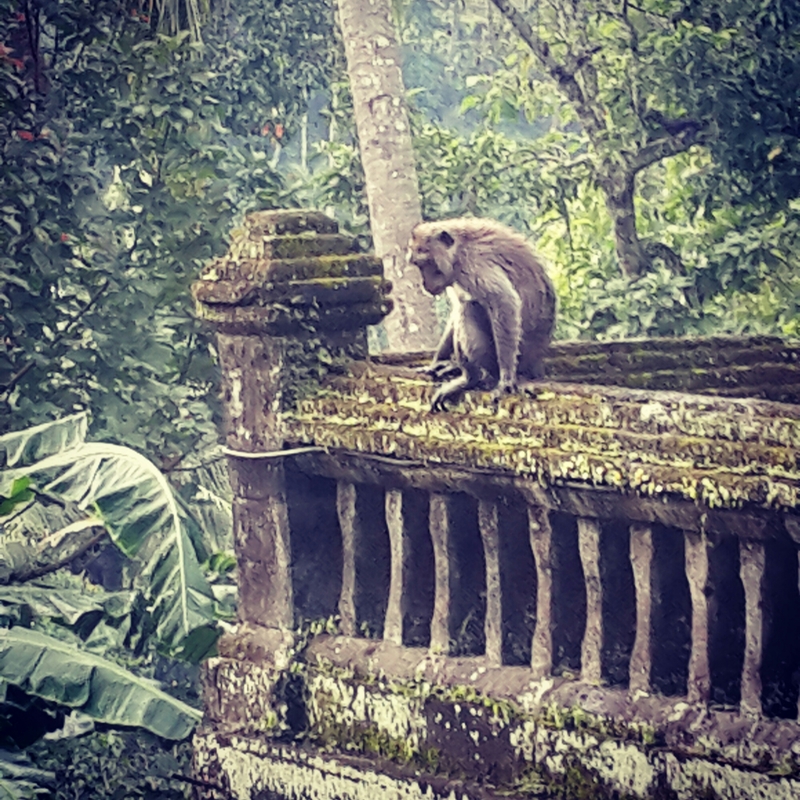 We had a wonderful time on this tour and then on our way back to Ubud after a great day, I asked if he would mind stopping at a place for us to try Luwak coffee. 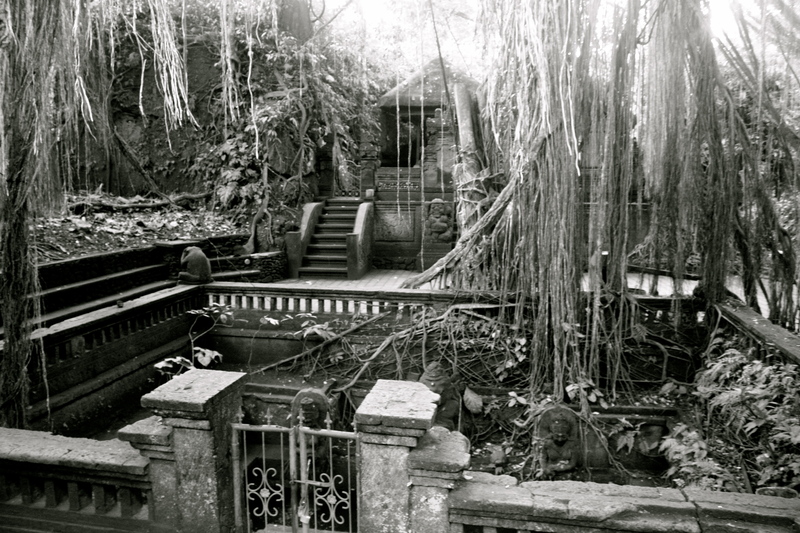 We thought that it might have been just a coffee shop but it was actually a place where the Luwak coffee is made. 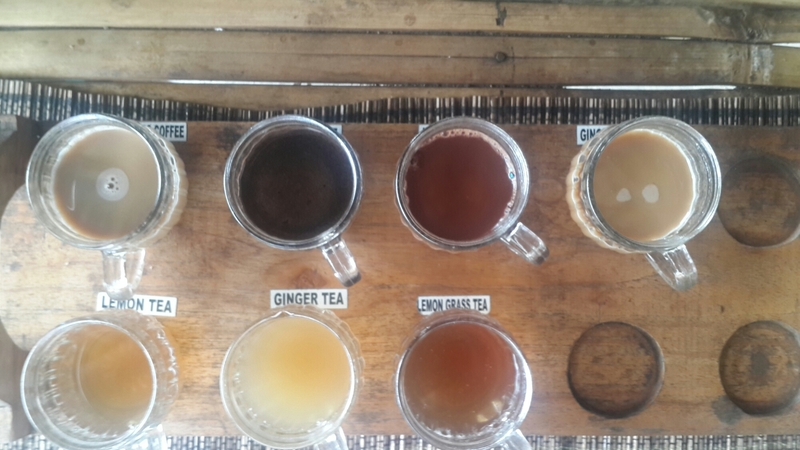 I didn’t really know too much about Luwak coffee before going to Bali. It is the most expensive coffee in the world. 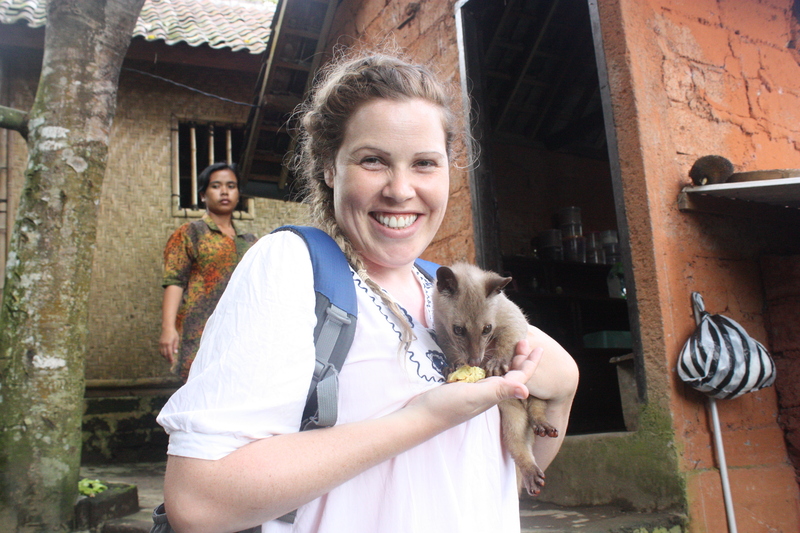 It is made by collecting the poop of the Luwak animal and getting the coffee from it. 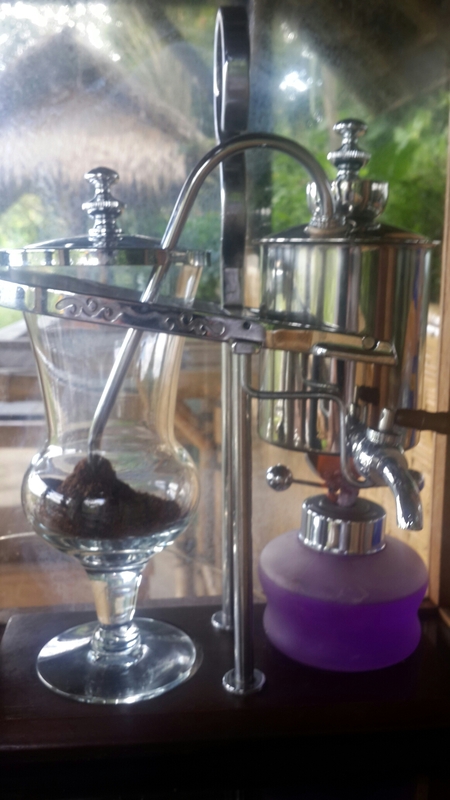 The Luwak apparently only eats the best coffee beans so by taking it from their poop, it guarantees that it is the best coffee beans and it’s perfectly fermented too. 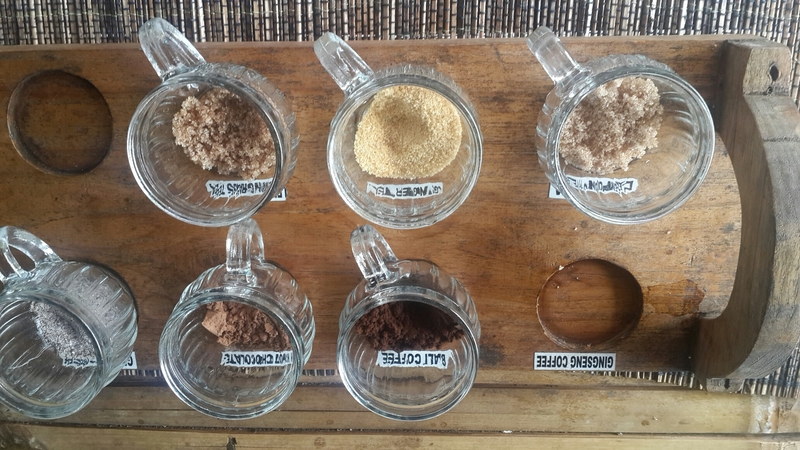 During the tour they allowed us to taste many different types of coffee, including the luwak coffee. It did taste good. We got to see some luwaks which broke my heart. They are animals that have been taken from the wild and forced in to small cages. They looked very unhappy. It was a very sad sight to see and made me feel sad that by paying for the tour we were contributing to it. 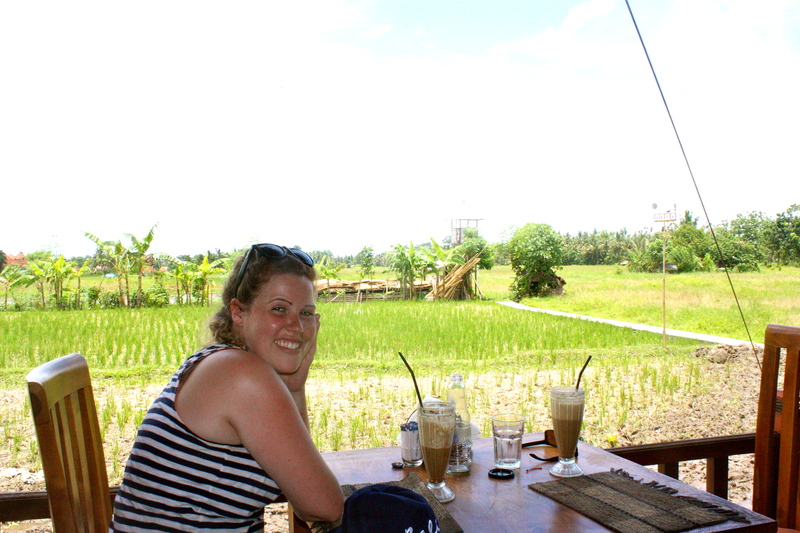 After the coffee it was time to go back to Ubud. We were both exhausted but extremely happy after our tour. 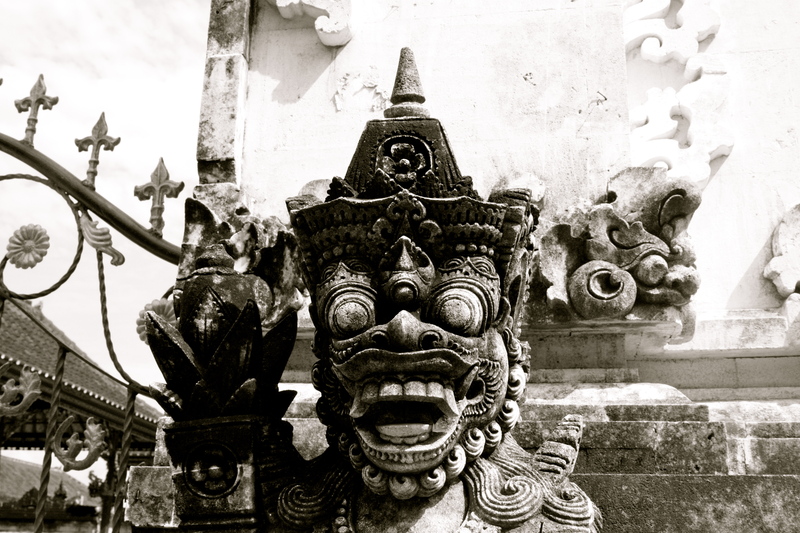 Our Driver: There are many drivers all over Bali that offer day trips. 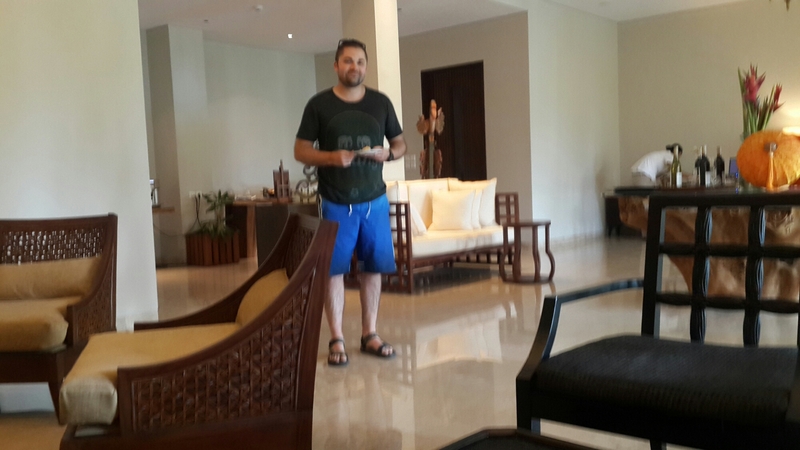 We found out about Gejor from our friend Ian who had used his services while in Bali and really enjoyed it. We were so happy with our tour and Gejor was so easy going. It felt like we had known him for longer. As I mentioned earlier, he also made changes to our day with no bother whatsoever. You can find his website here. We contacted him through his facebook page and he was always super fast at responding! 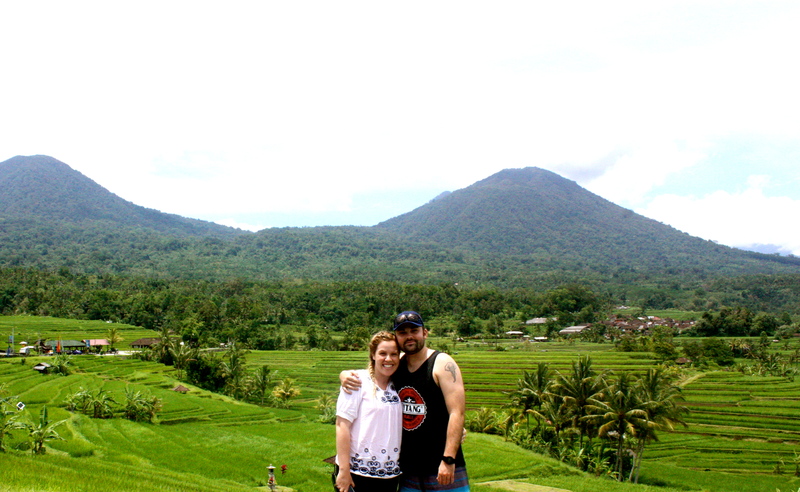 We did the Bedugul tour that is advertised on his website. 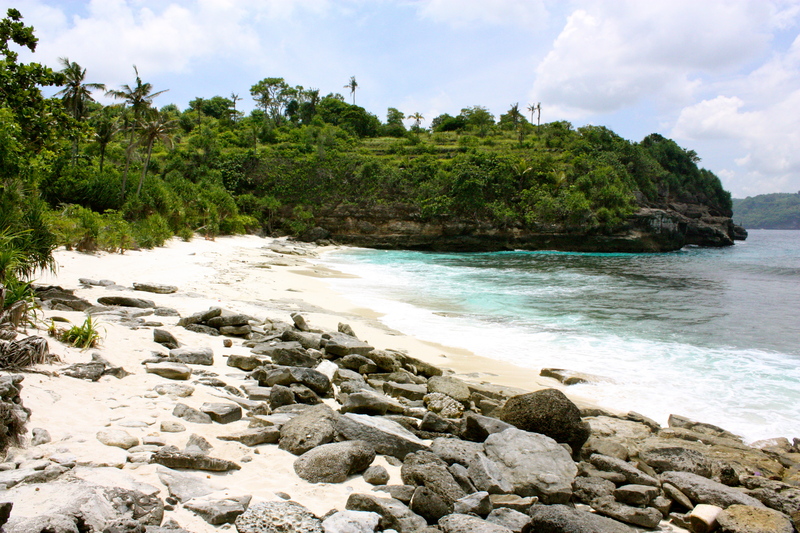 Nusa Lembongan; an island to remember! 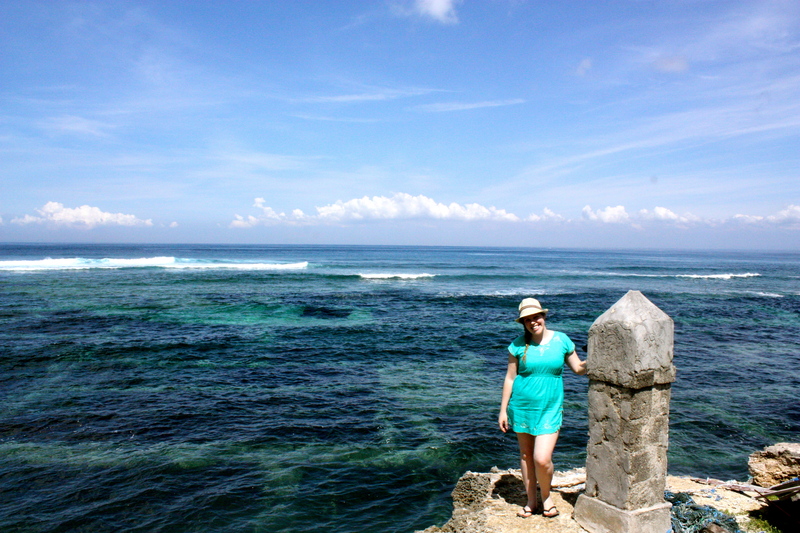 Nusa Lembongan was everything that we hoped it would be. 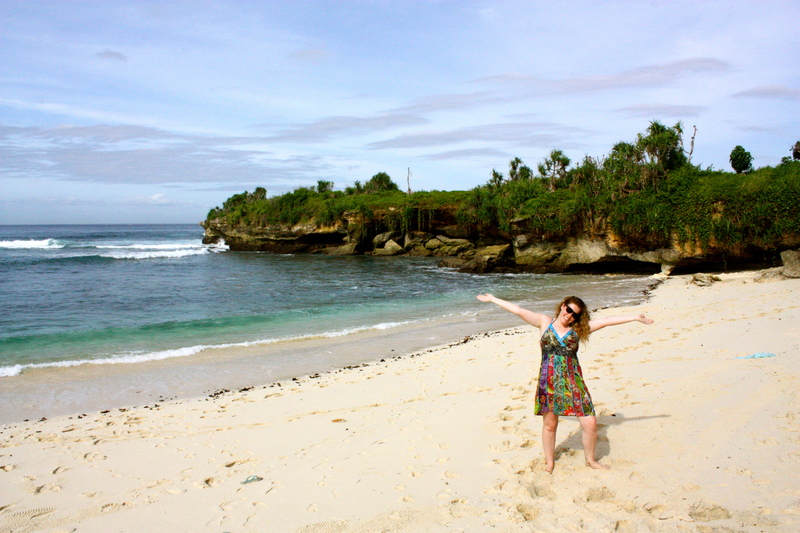 It was so chilled and not at all like what I heard the beaches in South Bali were like. The beaches were rugged, the food was delicious, the people were so friendly and the pace of life was so relaxed that it was perfect! 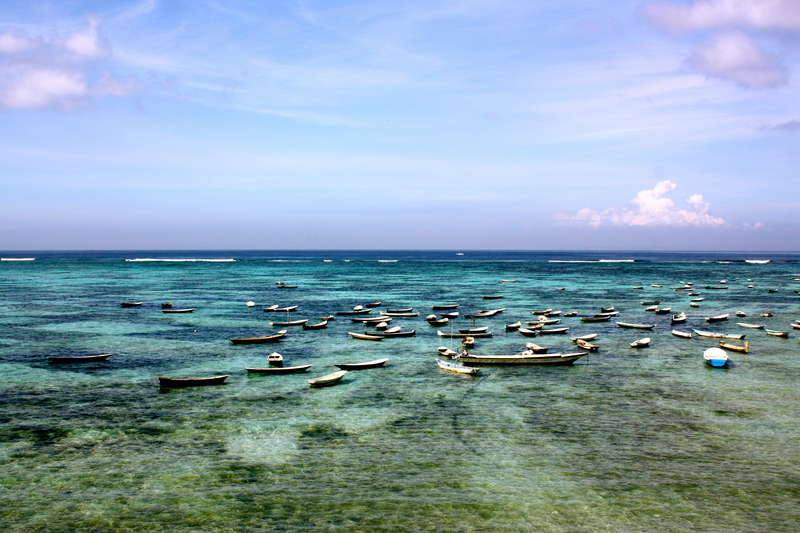 We went during the rainy season which meant that we had beautiful sunny mornings that turned in to cloudy evenings. This was great for us as we are early birds anyway so We managed to get so much done in our mornings. 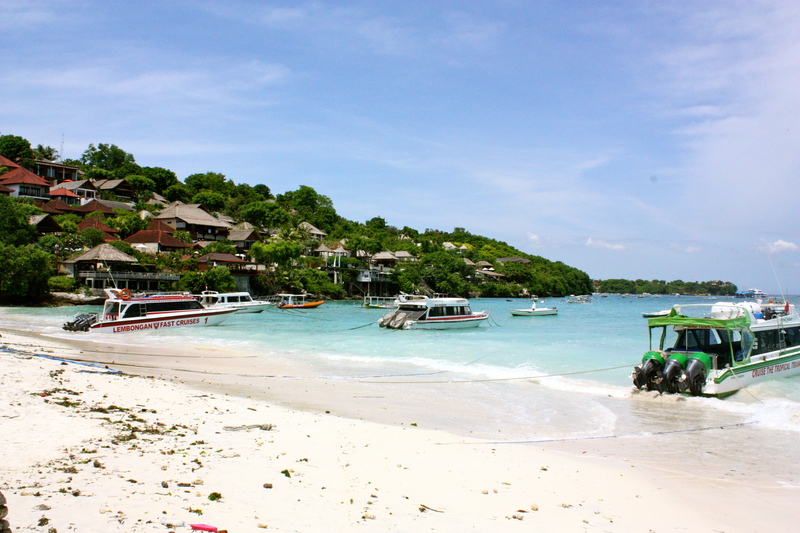 One of the most popular things to do on Nusa Lembongan is to rent a moped and drive around the island. 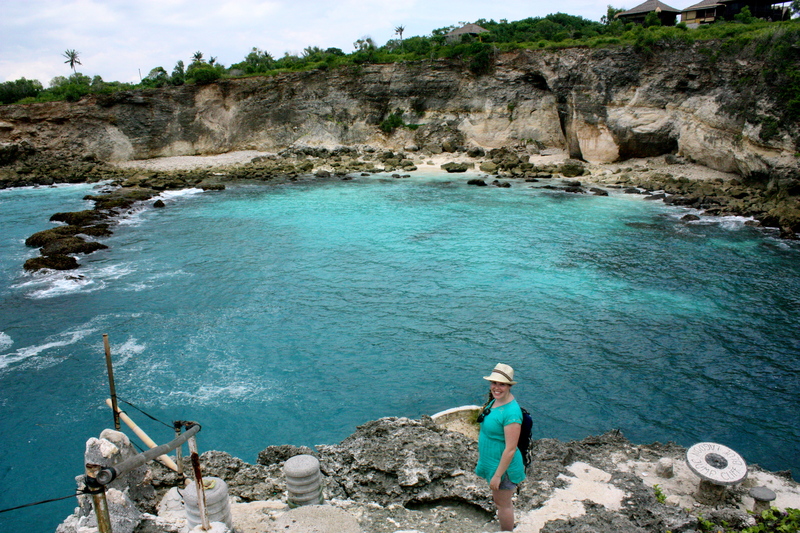 I’ve already written about our day driving around the neighbouring island of Nusa Ceningan here. 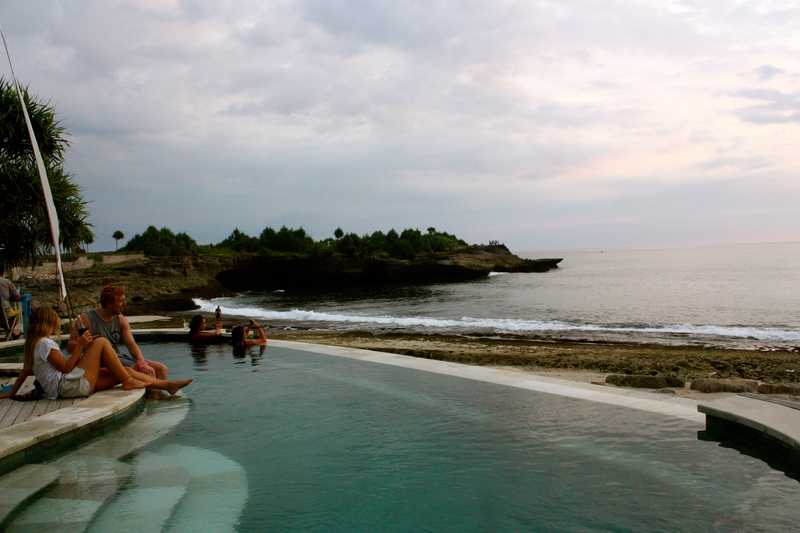 After our drive around Nusa Ceningan we decided to have dinner at The Sandy Bay Beach Club (it’s famous on the island for its food and sunset views). It definitely lived up to our expectations. 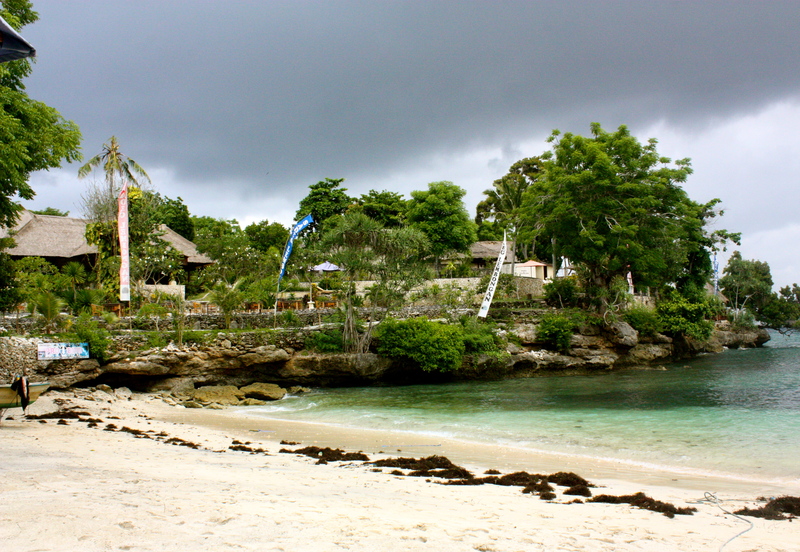 We were staying right by Tamarind beach. It isn’t an exceptionally nice beach and we never actually swam there (but it was nice to eat dinner or have drinks there because it was so quiet) but mushroom beach was only a ten minute walk away and was much nicer. 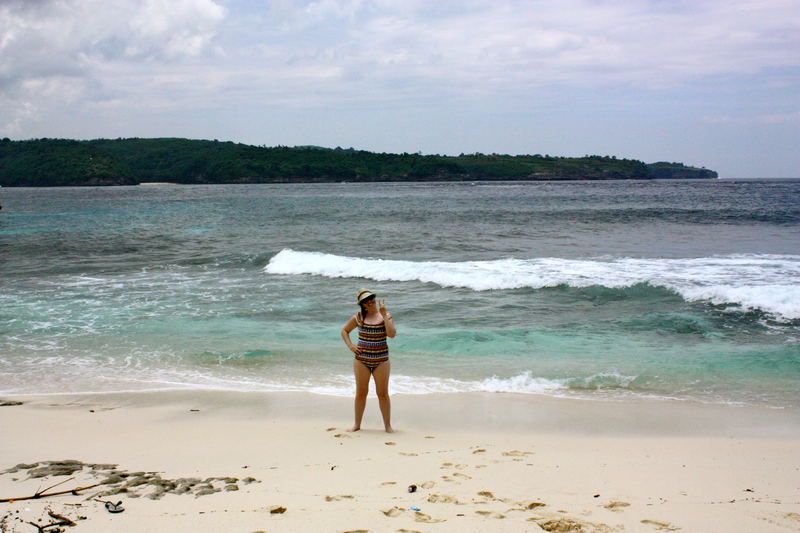 When we weren’t at the nearby beaches we were discovering the rest of the island. 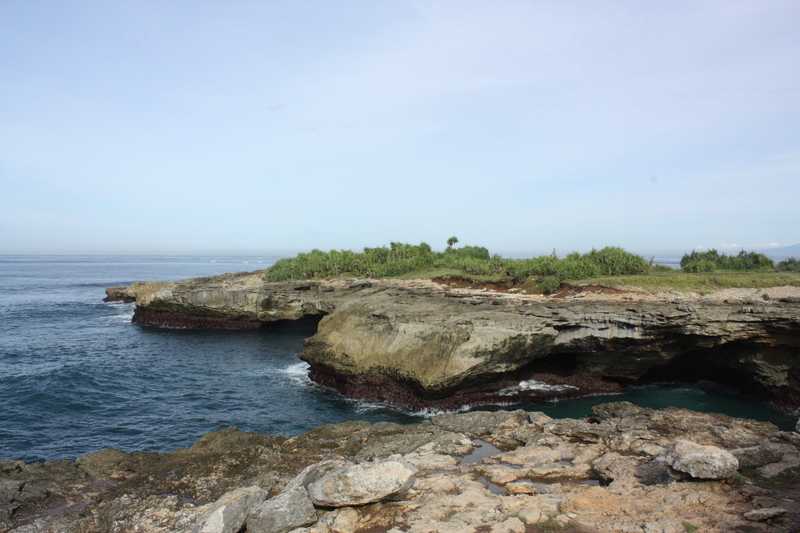 One morning we decided to drive up to a beautiful view point of the island. 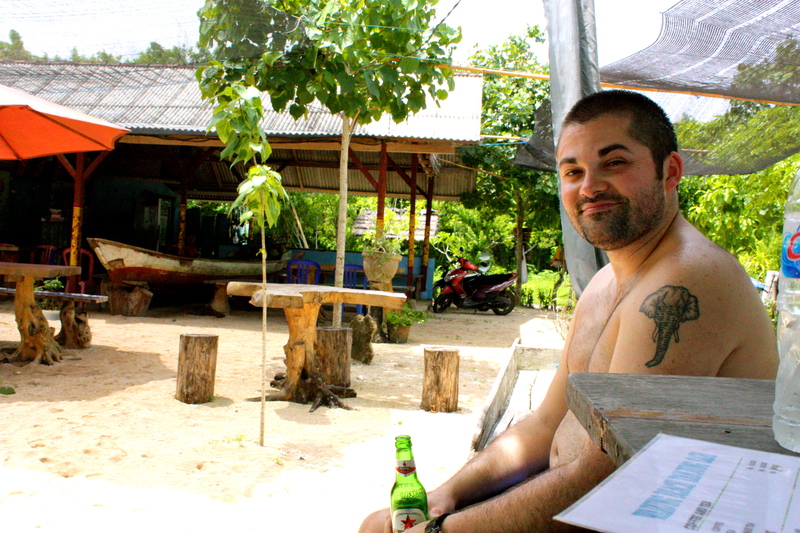 While driving we saw a nice quiet beach and decided to stop at a warung and have a quick swim there. The woman working there then told us that her husband does different tours. 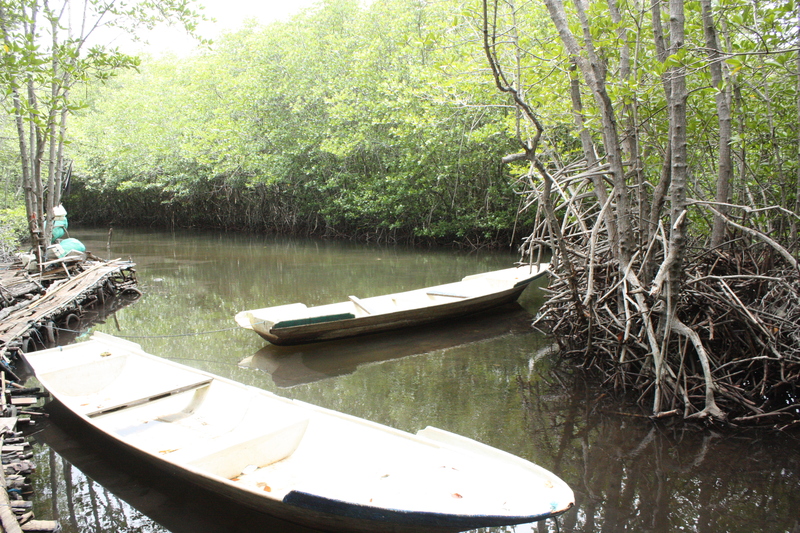 We decided that we wanted to do a mangrove tour and then go out and do some fishing. Her husband didn’t look very happy that we wanted to go fishing but agreed to take us. We were a bit confused but later realised that it was because the weather was going to be bad…luckily for us we canceled the fishing trip as a big storm came along that afternoon. 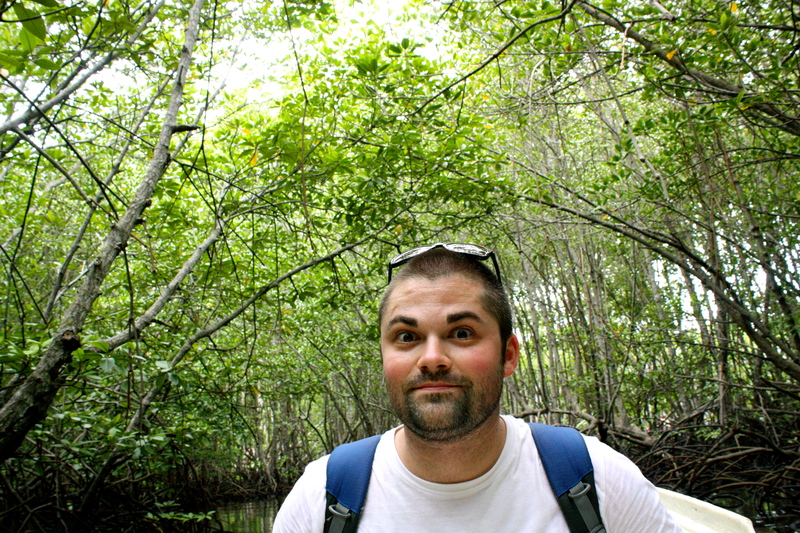 The mangrove tour was good. 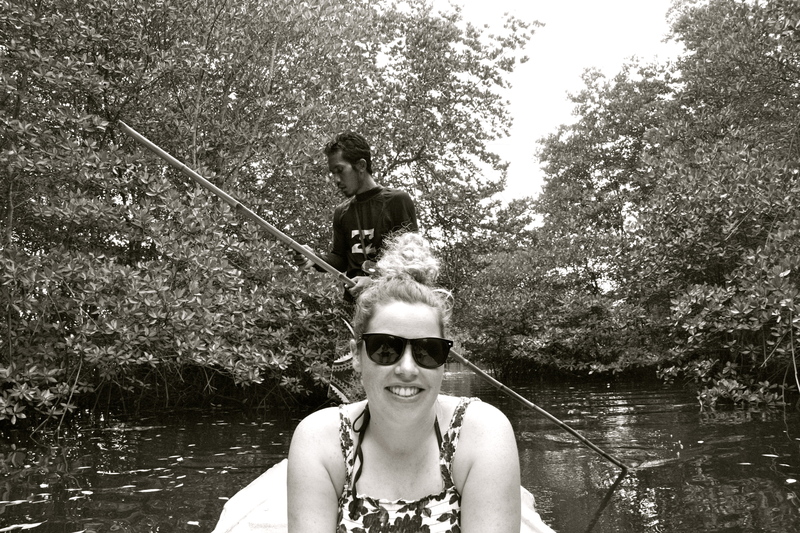 We were in a small row boat going along the mangroves, we managed to see a big lizard and enjoyed the peacefulness of it all. 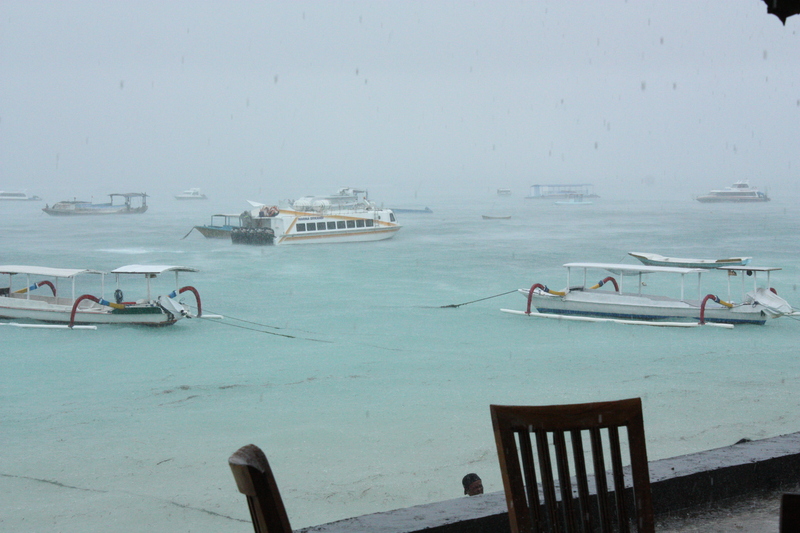 We then tried to drive back to our accommodation but got caught in some rain so stopped at a restaurant for about an hour and watched the rain coming down over the ocean. On our final day we decided to try to find the Devils Tear. It’s a rocky cliff area that is famous for having huge waves, unfortunately when we got there the tide was out and we only got one good crash but we were both glad that we got to see it. 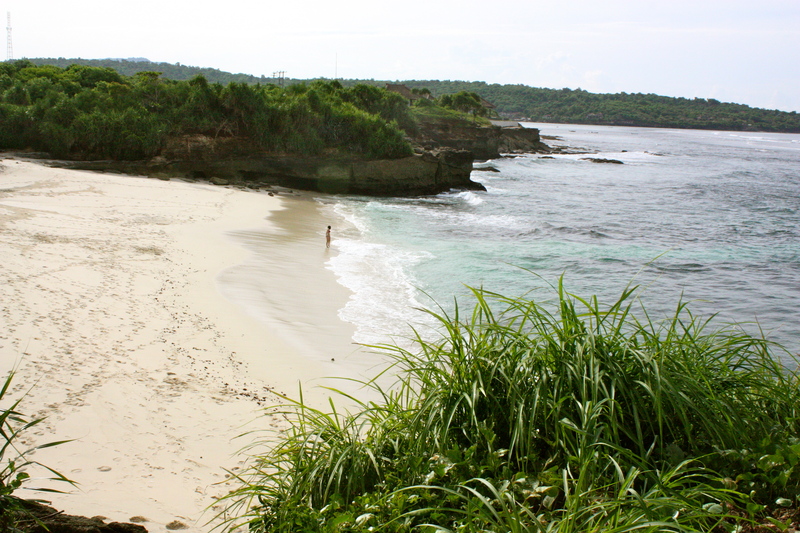 Our final stop on Nusa Lembongan, and definitely the best, was the beautiful Dream beach. What can I say? 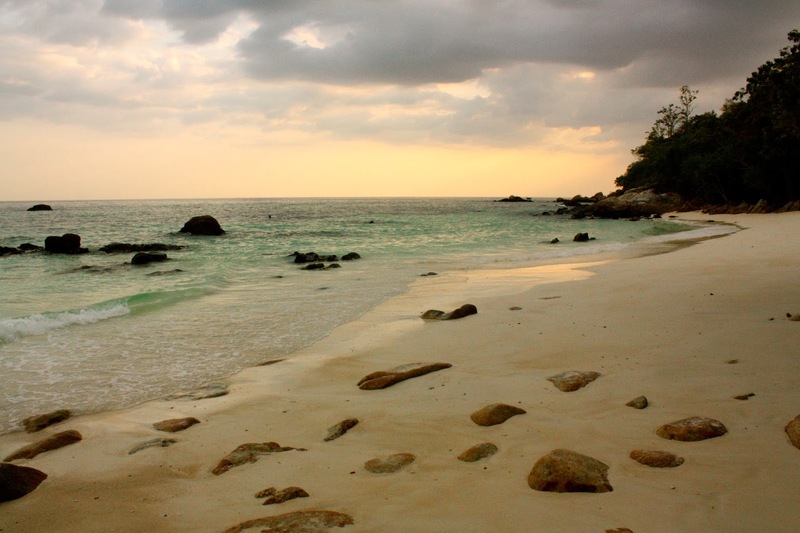 It truly was a dream to spend the morning on this picture perfect beach. 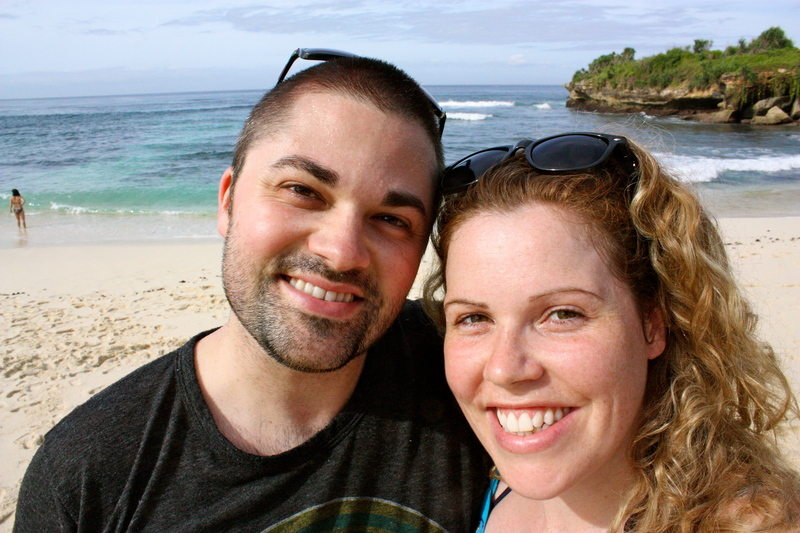 Before we knew it, it was time to leave this beautiful island. 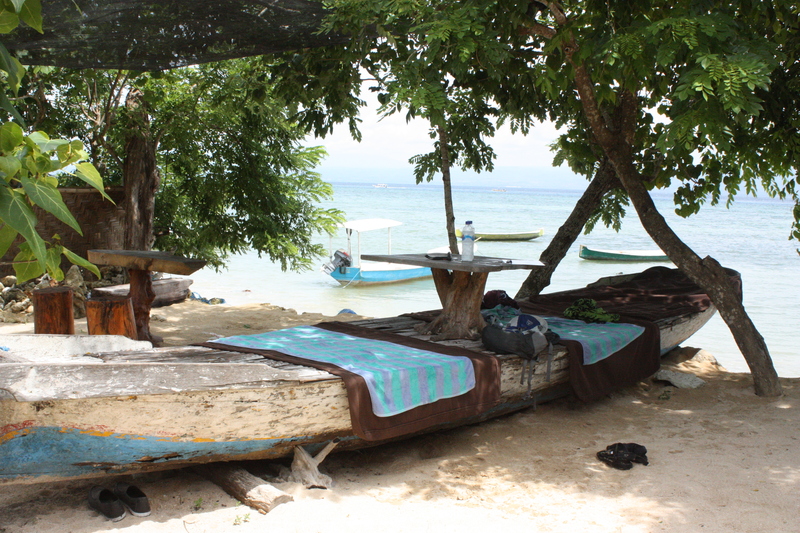 Where we stayed: We stayed in Cassava Bungalows. They are a small resort with only about 8 bungalows so it’s nice and quiet. The staff were amazing, so friendly! 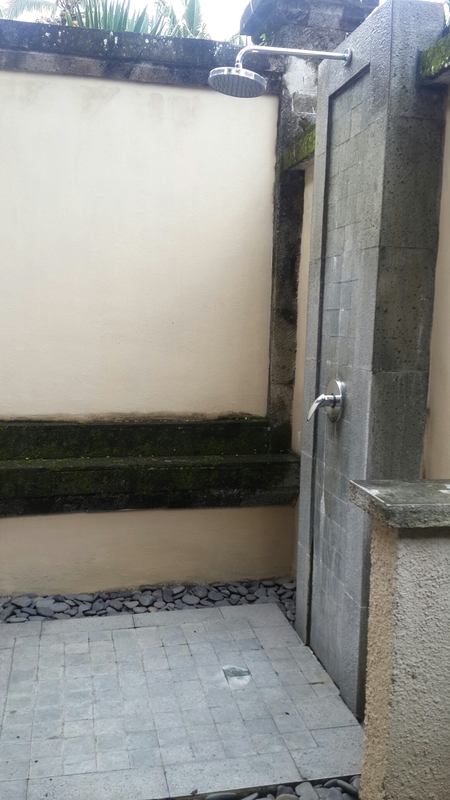 All of the bungalows are the same but they have a nice outdoor shower (it’s really great to use when it’s raining!) 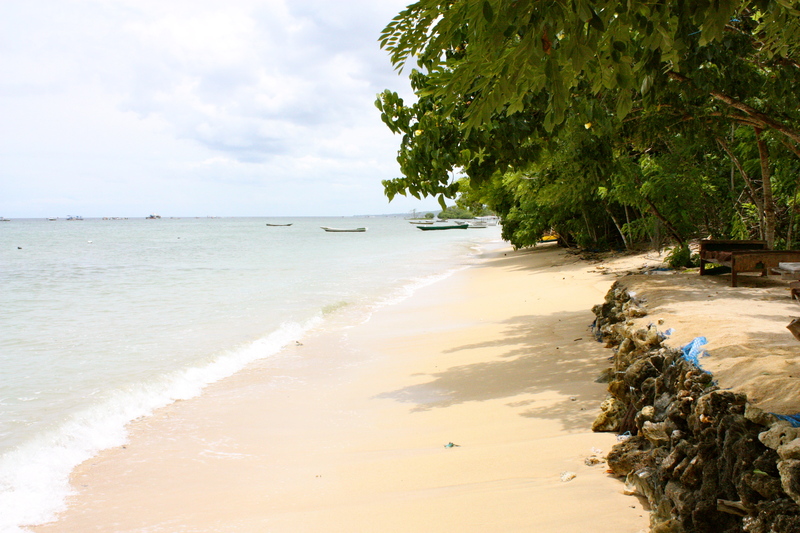 They are very close to Tamarind beach but the beautiful Mushroom beach is only a 15 minute walk away. You can view their Tripadvisor reviews here. 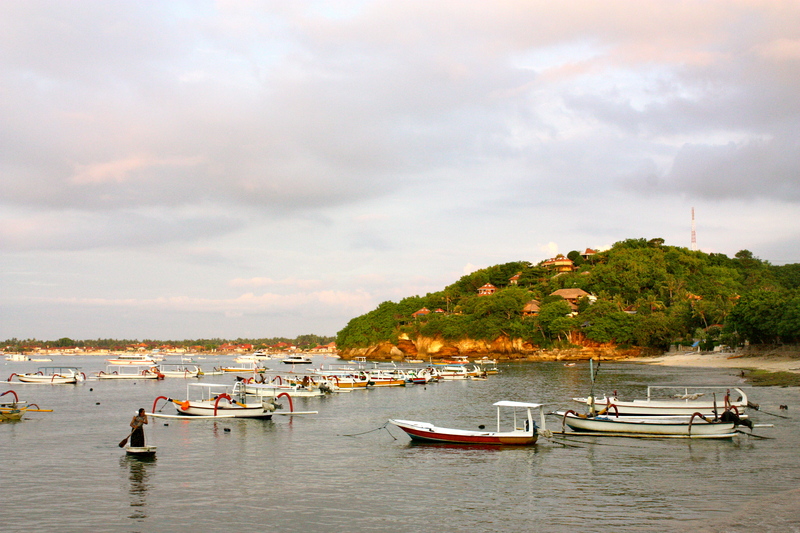 How we got there: We used Scoot cruises to get from Bali to Lembongan. 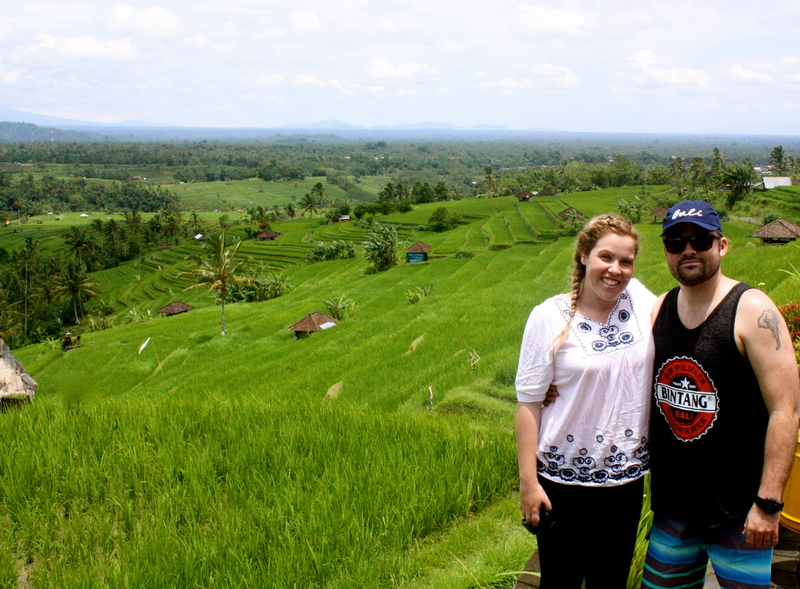 They have an excellent safety record and collected us from our guest house in Kuta and then dropped us to our hotel in Ubud. You can find their link here. 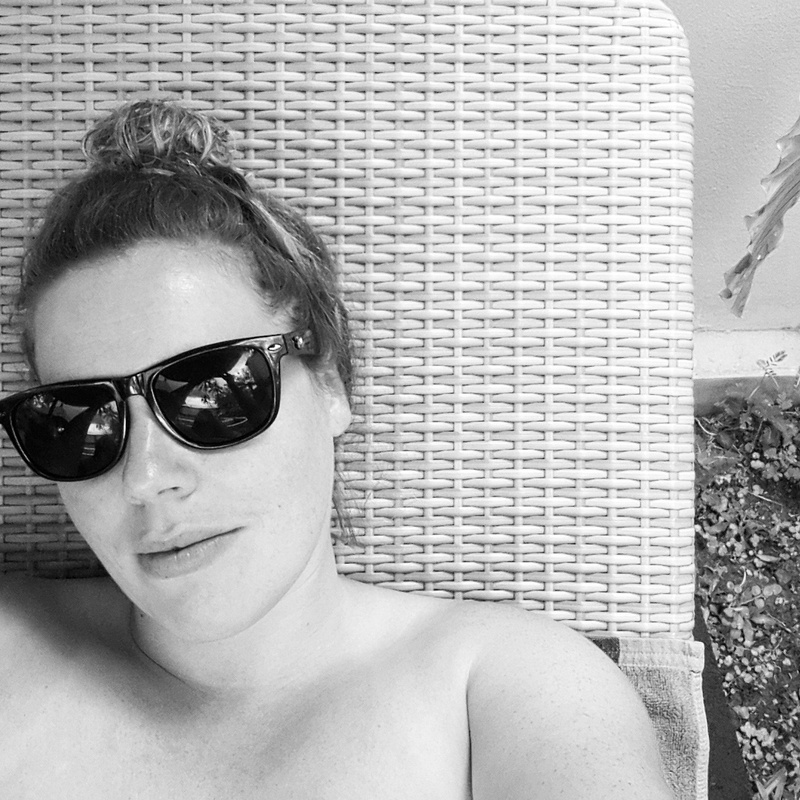 I’m not going to lie, I wasn’t very upset or panicked about turning thirty. 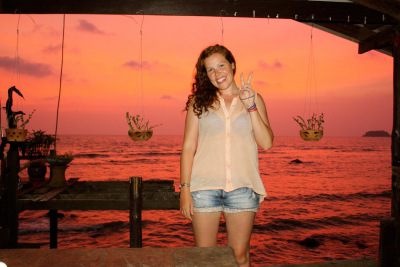 I think that I’ve had an incredible decade during my twenties and I have no regrets so that definitely made it easier. I think that all of the exciting adventures that are coming up for my little family also made me excited about the big 3-0. 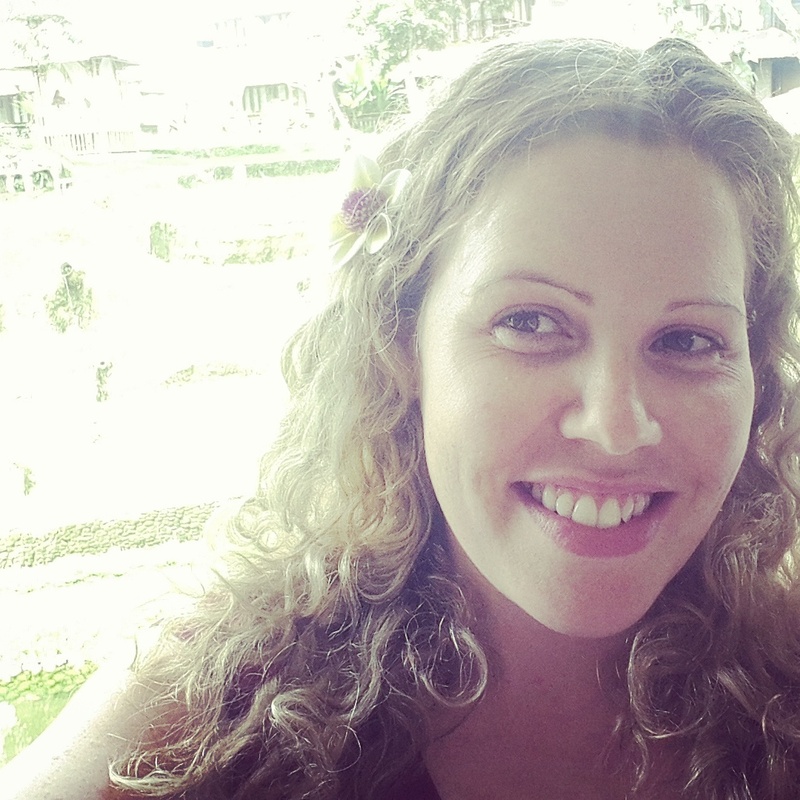 But the fact that I was celebrating it in an amazing 5 star hotel with my wonderful husband in Bali definitely made turning thirty a lot easier! It was a perfect day from start to finish. I woke up at about 7:30 and we chatted in bed for a while. 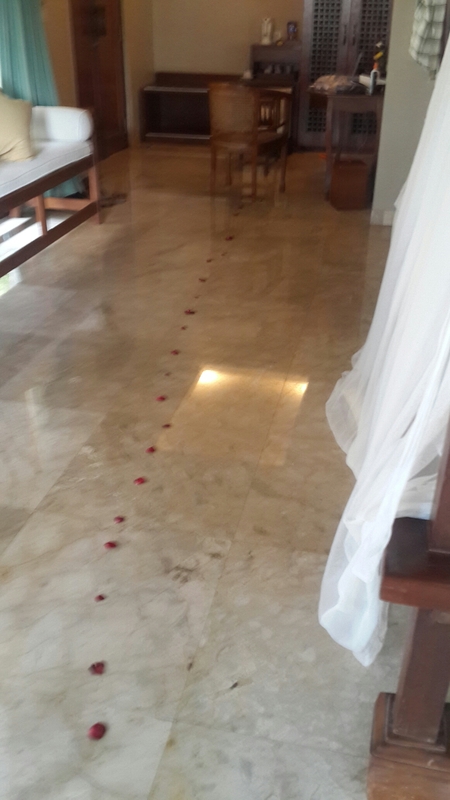 I then got up to use the bathroom but found a beautiful rose petal path instead. It led me to my laptop and to an envelope. I opened my laptop to find a folder on the desktop saying open. On it was a beautiful 10 minute video full of birthday messages from all of my family and friends all over the world. I even got to see one of my best friends new baby on it! It really was the perfect way to start my birthday! 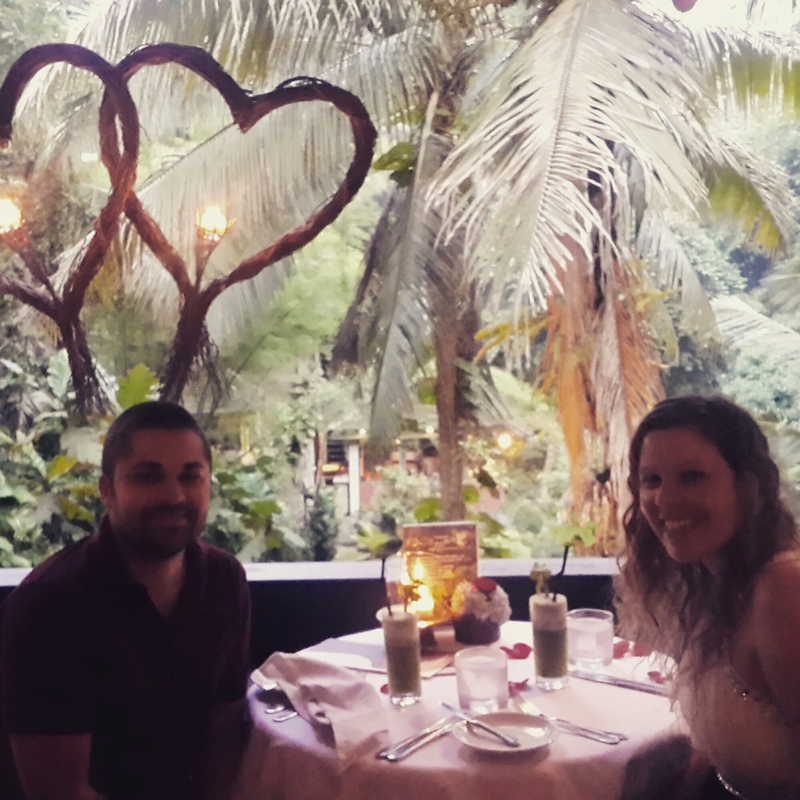 I then opened the envelope to find that we would be going on a couples spa day to Bali Botanica spa followed by a three course dinner at Bridges restaurant! I was so excited!! He had also made some wonderful vouchers for lots of random things that I’m definitely planning on using on him in the future! (massages, date nights, hugs etc.) How great is my husband?! 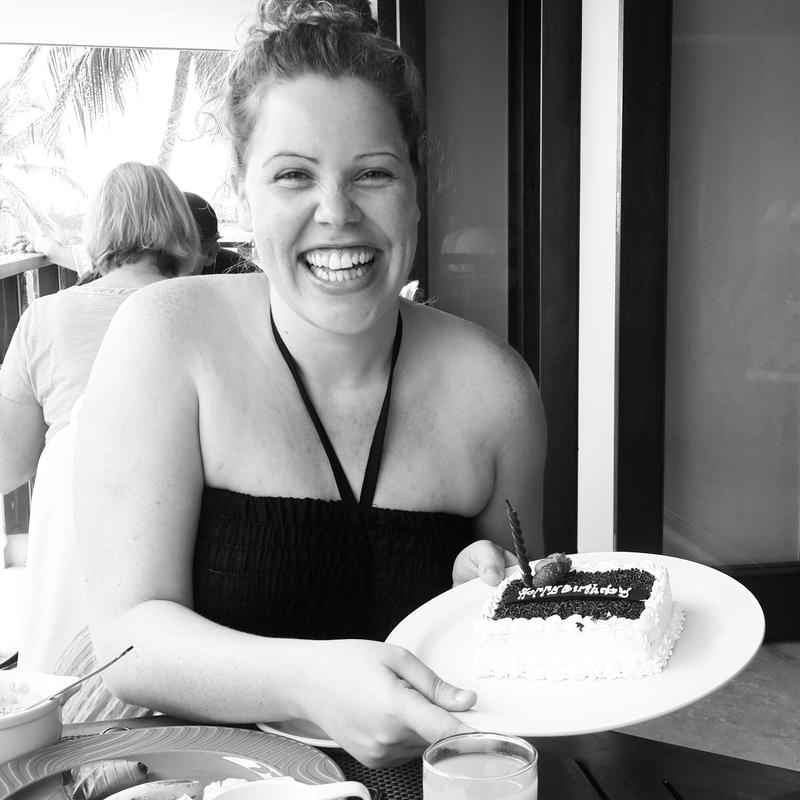 We went up for breakfast in the hotel only to find all of the staff singing happy birthday to me with a birthday cake. Neither of us had mentioned it to them and when they started singing it didn’t even click that it was for me. But it was such a lovely gesture from them and the guy that organised it was so excited! 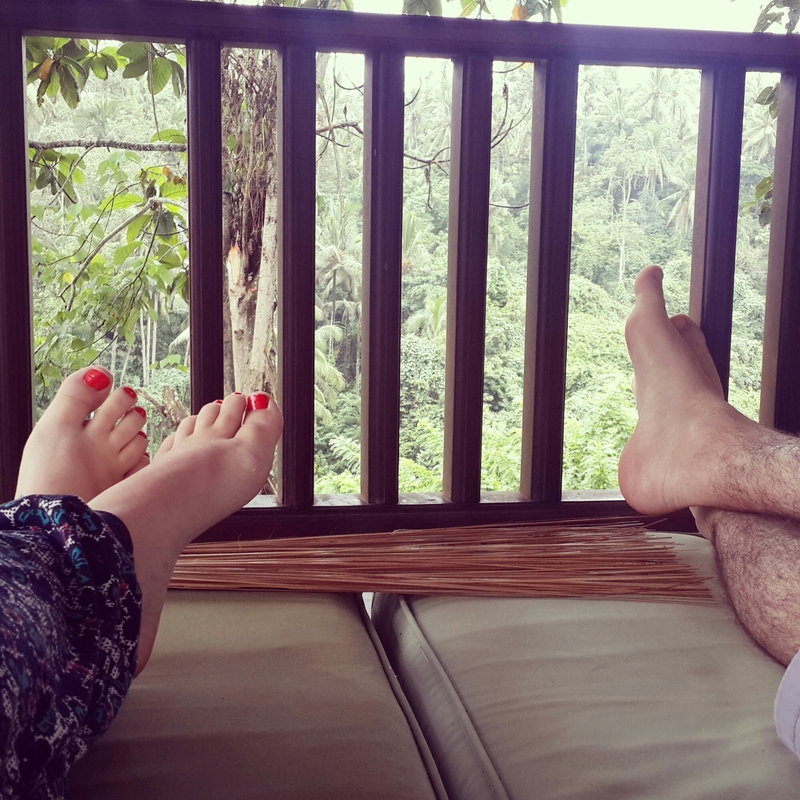 Afterwards it was still pretty early and we weren’t being picked up for our spa until 2 o clock so we spent the rest of our morning relaxing in our day bed and just chatting while taking in our beautiful jungle view. 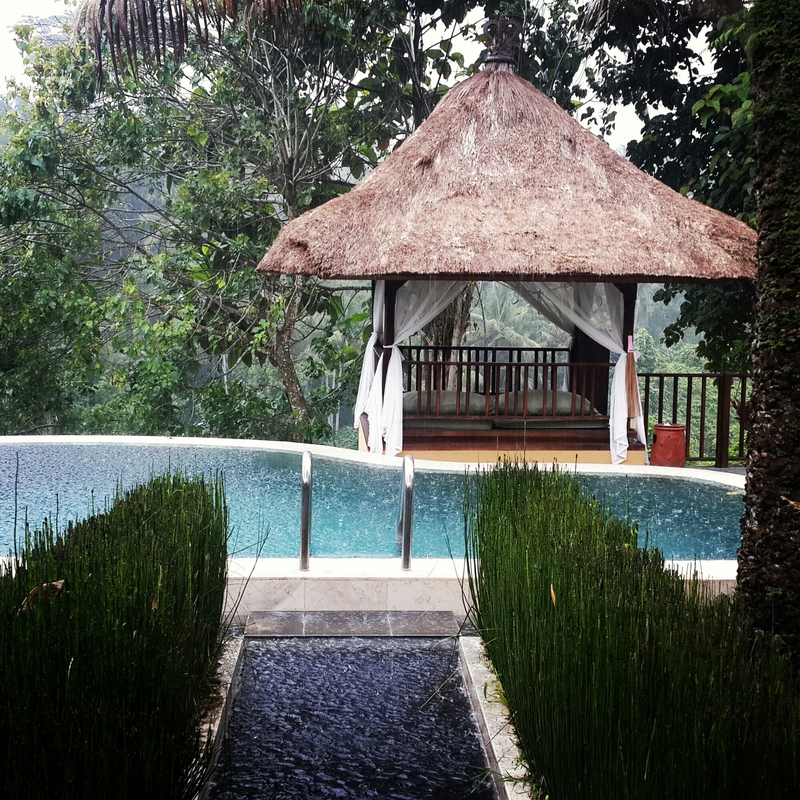 It rained a bit but as you can see, even the rain in Bali is beautiful! Before we knew it it was time for our spa day. When we arrived we were given a form to fill out. It was very impressive, we got to choose how hard of a massage we wanted, the areas that we wanted them to focus on, areas that we wanted them to go softer on etc. 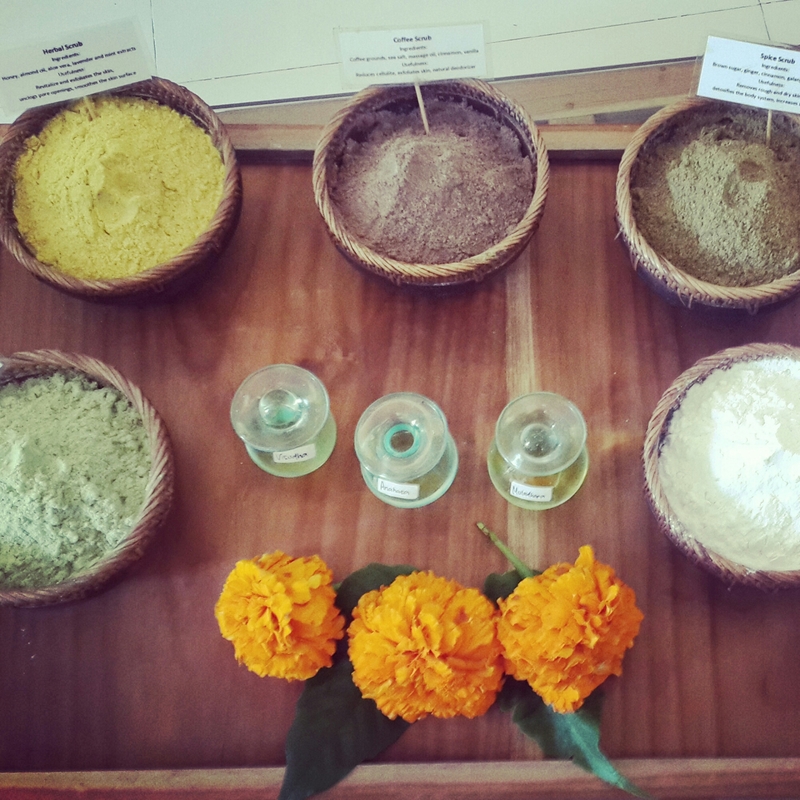 We then got to choose what type of rub to use. I chose a herb scrub which is supposed to be helpful to sensitive skin (plus I was suffering from a heat rash so they said the herbs would help to ease the itching). Jason chose a green tea scrub. 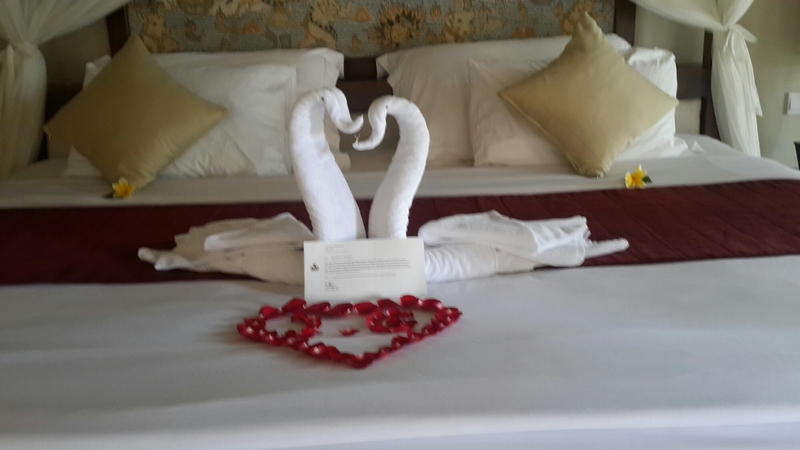 We were then brought in to our couples room. It was beautiful! 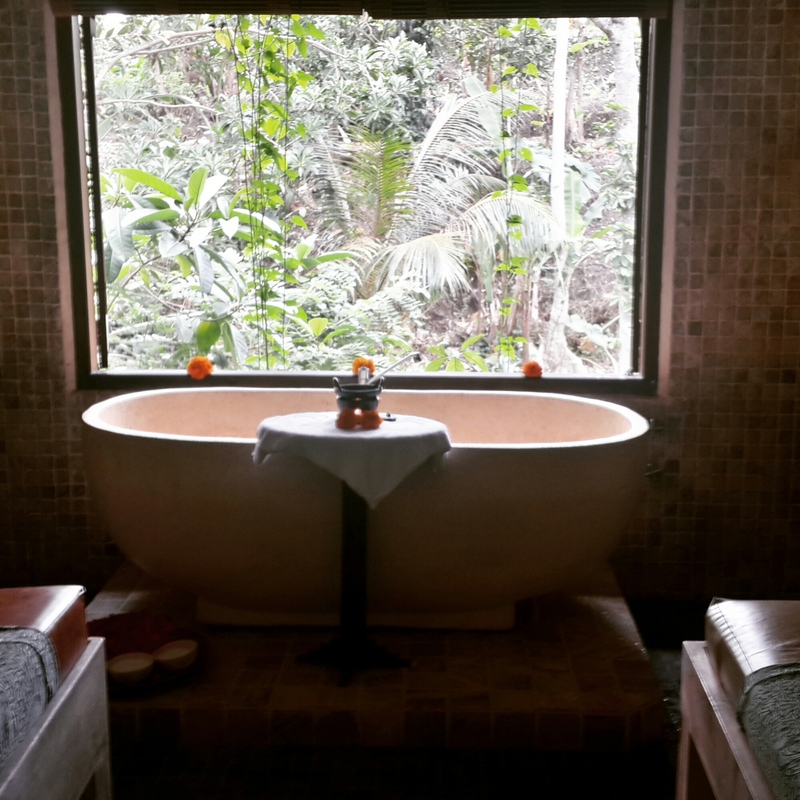 We had two massage beds, two showers and a beautiful bath in front of a window overlooking a river. 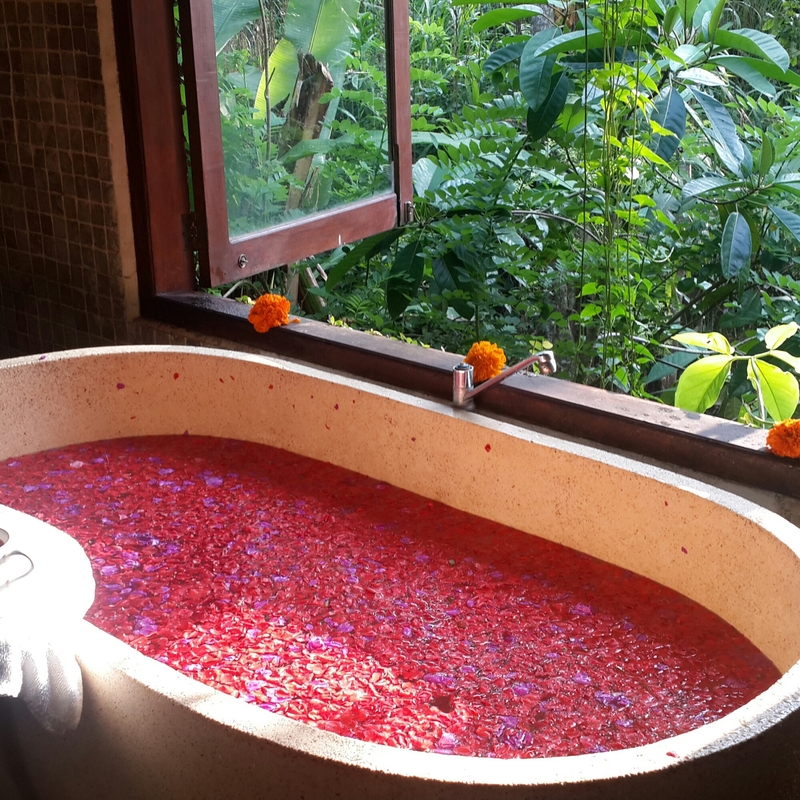 We had an amazing massage, followed by a full body scrub, then some natural yogurt on top of the scrub followed by a beautiful flower bath. The final part of our spa day was a pedicure. It was the perfect way to spend my day. Jason really pulled out all of the stops for my birthday and I just feel so lucky to have him for the rest of my life. Now I have to try to come up with something equally wonderful for his birthday this month! 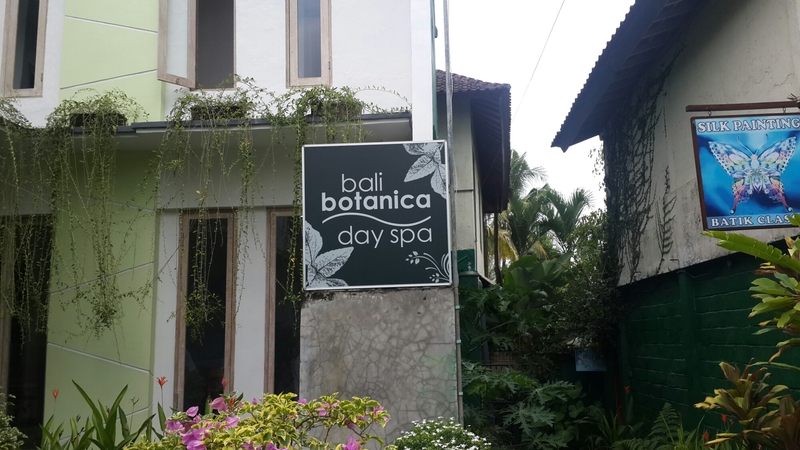 Spa: Bali Botanica is situated in Ubud and picks you up from your hotel. You can find their website here. Highly recommended! 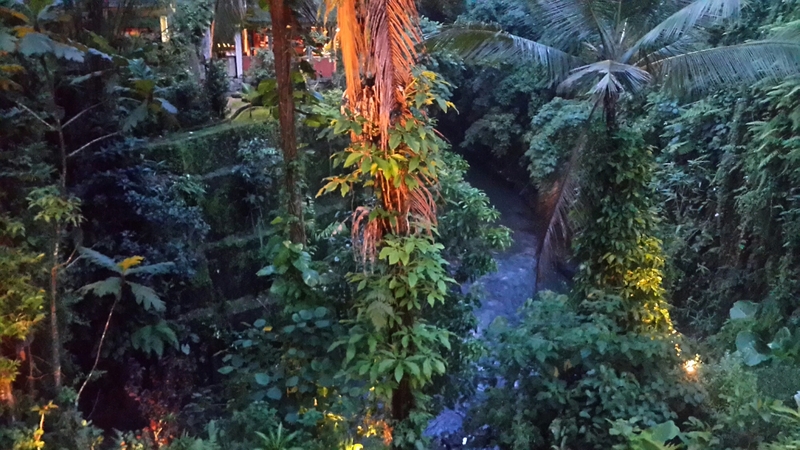 Dinner: Bridges is central to Bali. 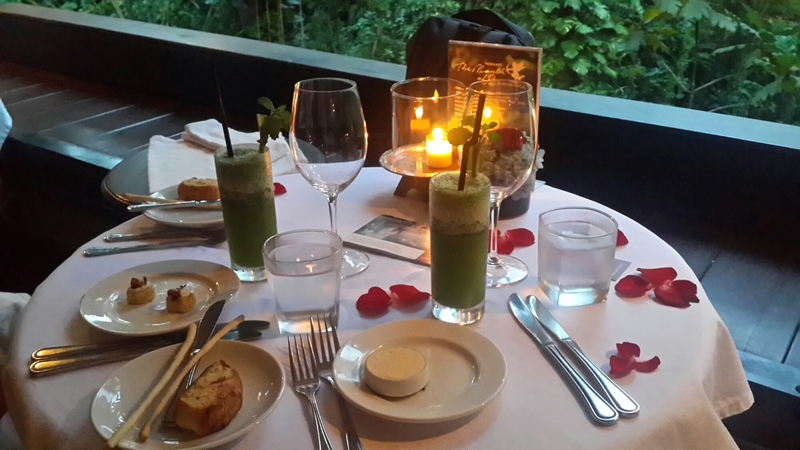 Our spa package included the three course dinner and the spa dropped us off at the restaurant after our treatments. You can find their website here. 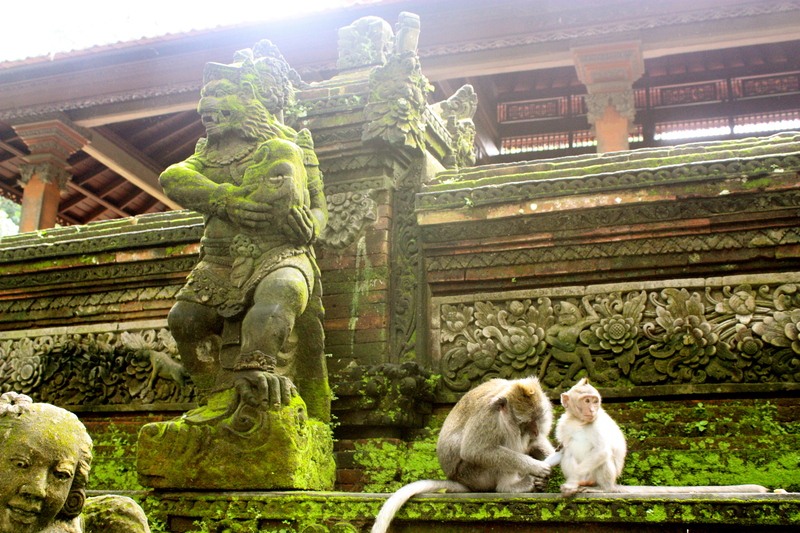 During our time in Ubud we decided to go visit the monkey forest. It surprised me a lot. 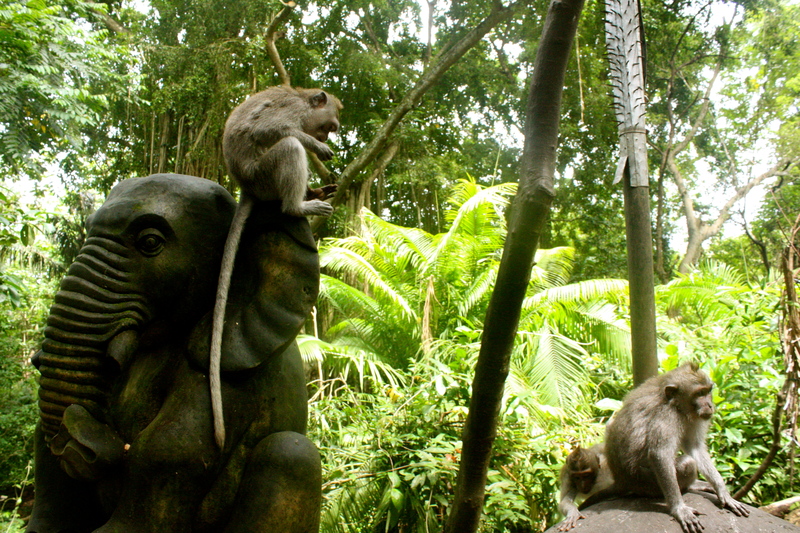 I was expecting a big touristy attraction but instead what I got was a beautiful jungle with a ton of monkeys! Seriously, they are everywhere! We went during the morning and luckily it wasn’t too busy. 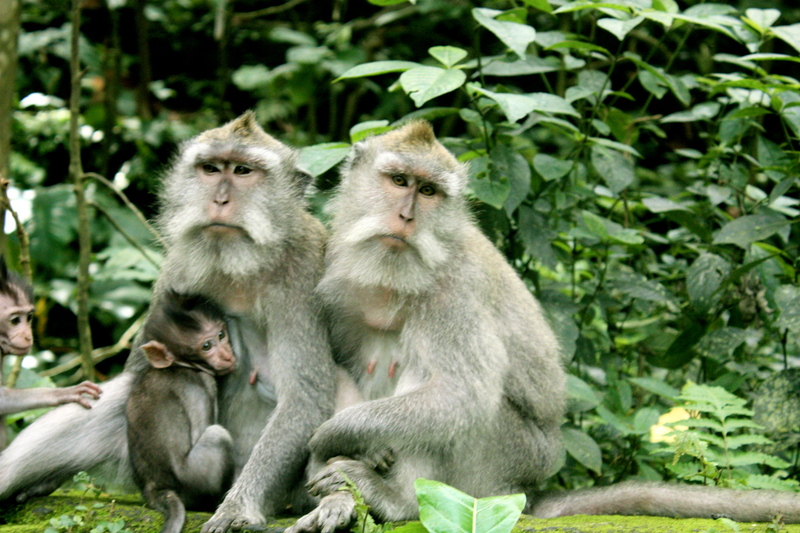 We saw families of monkeys from the second that we entered the forest. 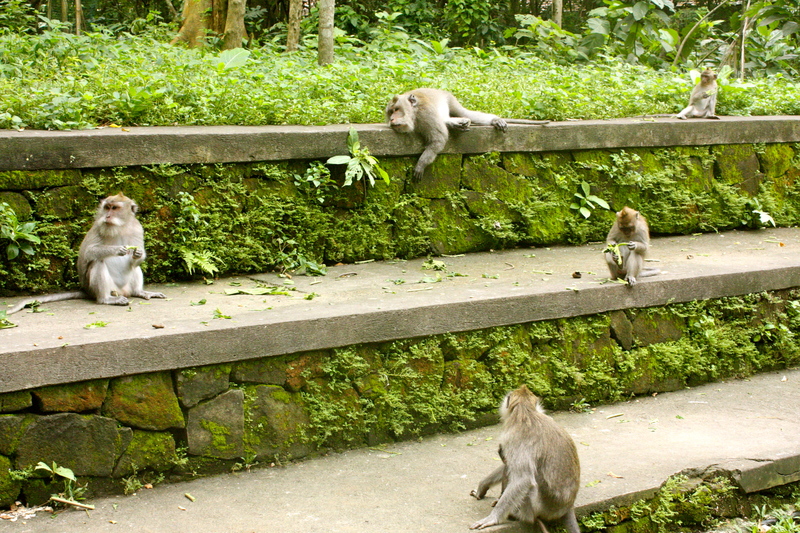 What I really liked about it is that the monkeys are completely free. 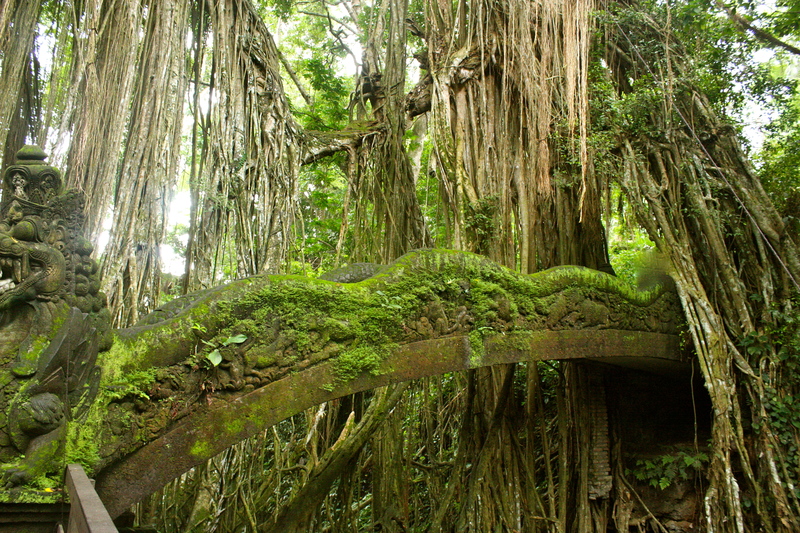 There are no barricades keeping them in the forest. They don’t have to stay where the people are and they genuinely rule the place! 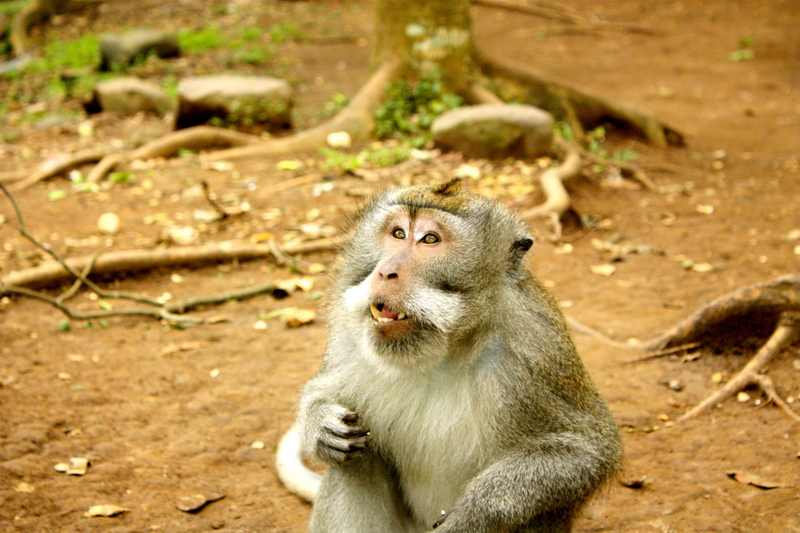 I honestly could have spent the entire day there just walking around and watching the monkeys interact with each other and the people. If you do go, be careful to only bring what you need, don’t bring any food, water bottles, cans etc. The monkeys will most definitely find them and steal them. Nobody wants to see those beautiful animals eating plastic or metal. 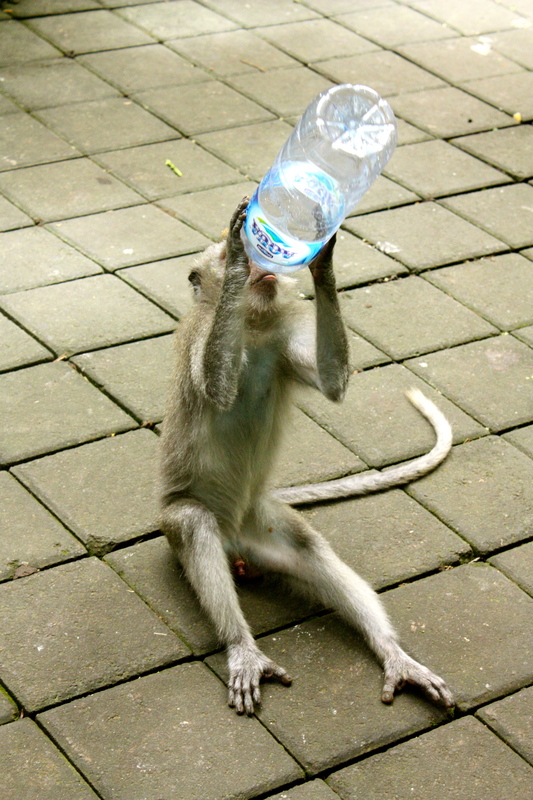 While we were there we saw monkeys with water bottles, coke can, and even one stole a woman’s mozzie repellant and was trying his hardest to get it open to drink what was inside it! 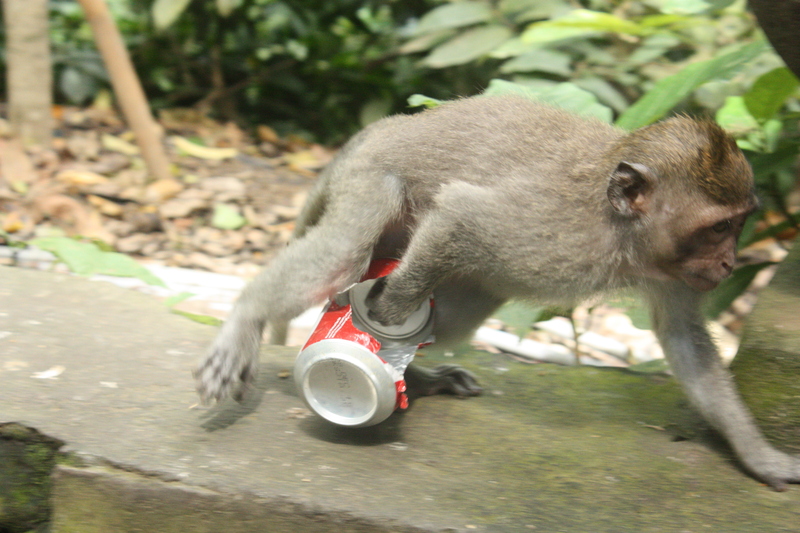 Luckily one of the people that works in the forest came along and the monkey scurried away. Afterwards we went to a nearby restaurant and had a delicious lunch with a beautiful view. This truly was the perfect way to spend a morning! 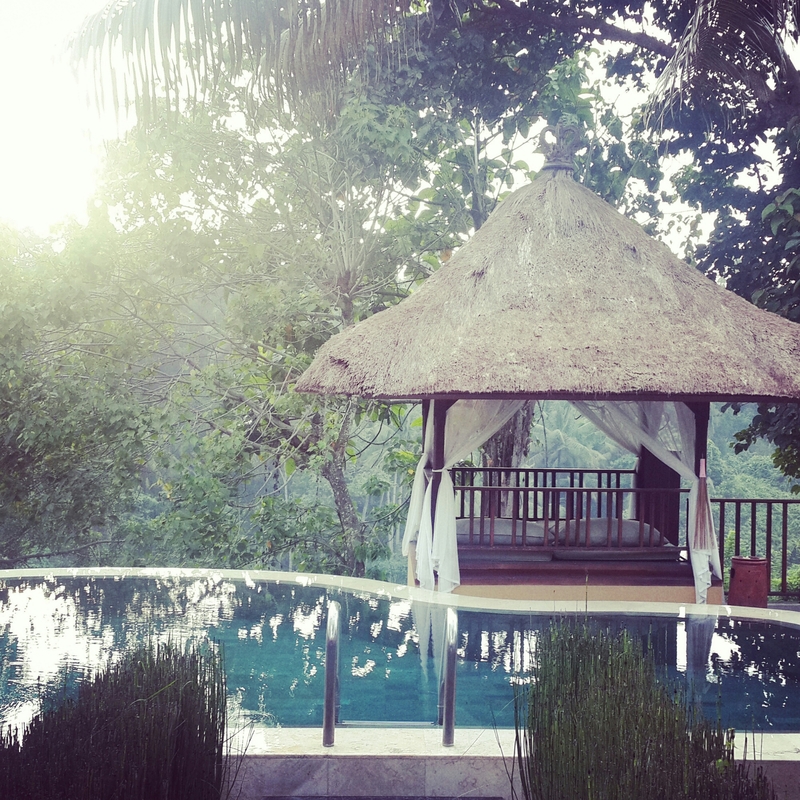 Where we stayed in Ubud: The Kamandalu. 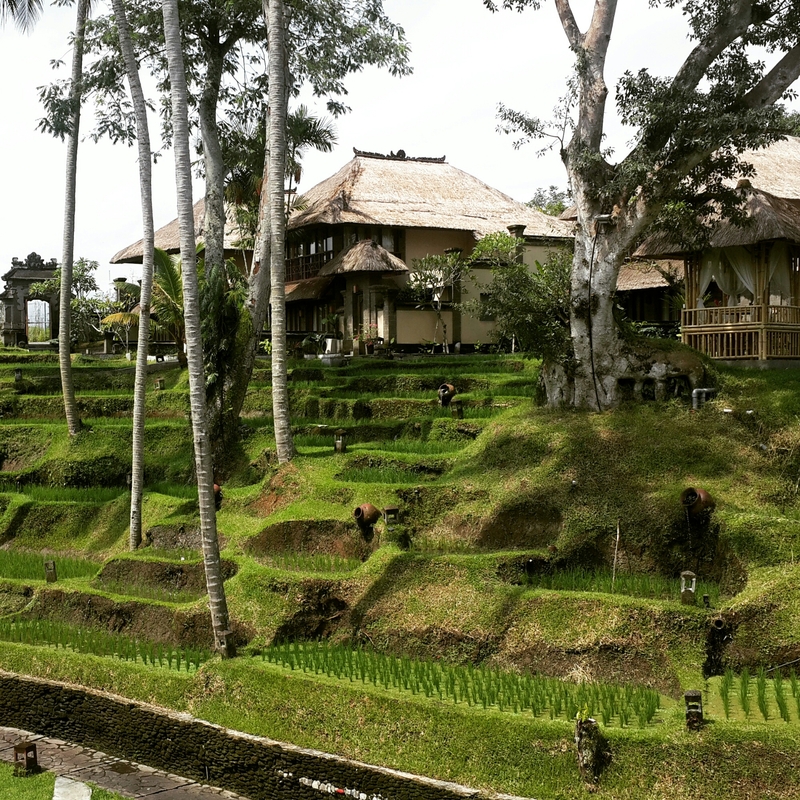 It’s a beautiful 5 star hotel just outside of Ubud and is by far the nicest place we’ve ever stayed at! You can see their trip advisor reviews here. Highly recommended for a honeymoon or special occasion! You can read the blog post that I wrote about our stay here. 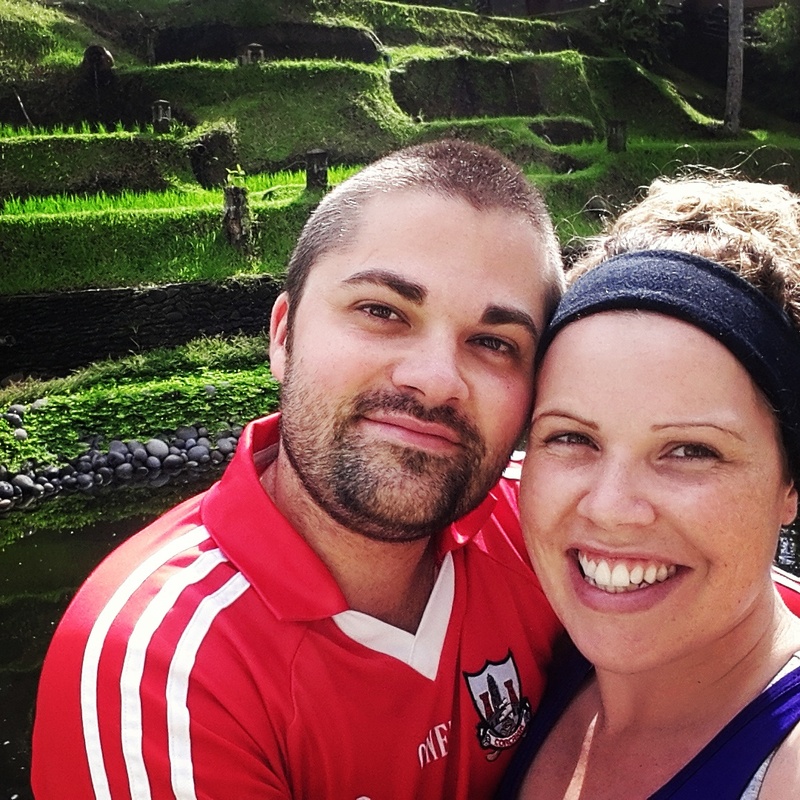 I don’t normally write a blog post just about a hotel but we had such an incredible time in this hotel that I wanted to share it with you. 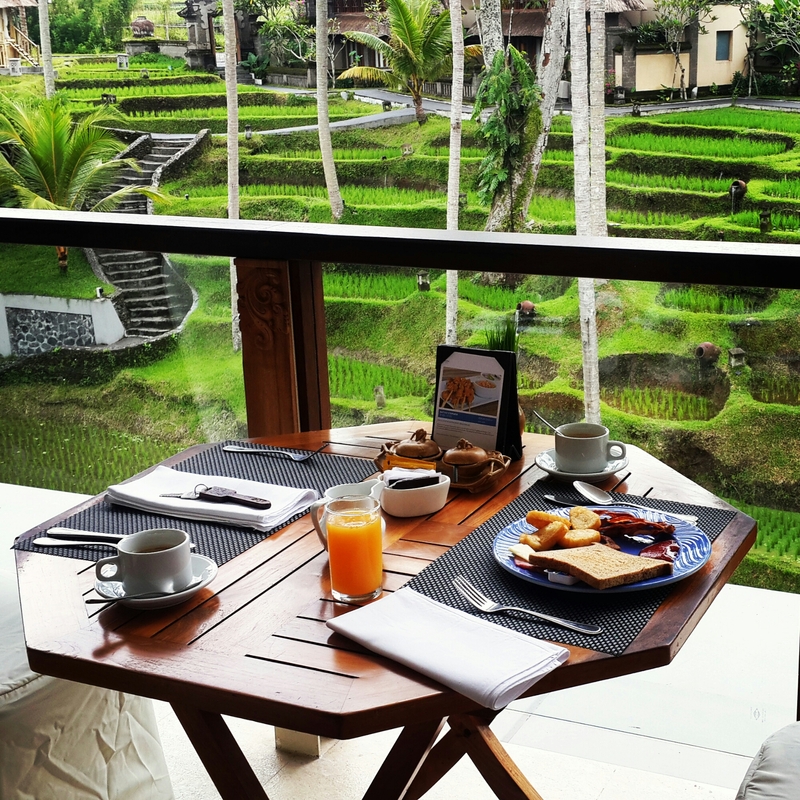 The reason that we choose Bali for our honeymoon is that you could get real 5 star luxury for a much lower price than in most other countries. 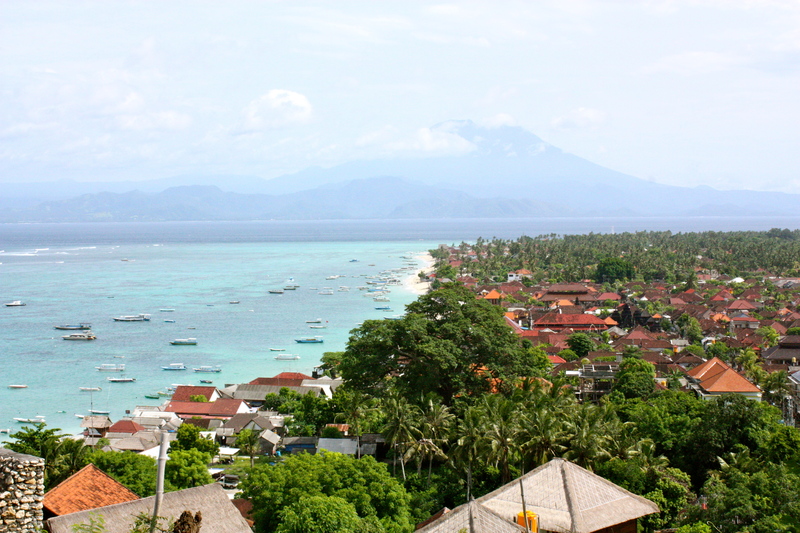 This was especially true when we were researching whether to honeymoon in Bali or the Philippines, the difference in the standard of accomodation at the same price brackets was startling! We had a couple of requirements when we were decided where to stay, a private pool was one of them. 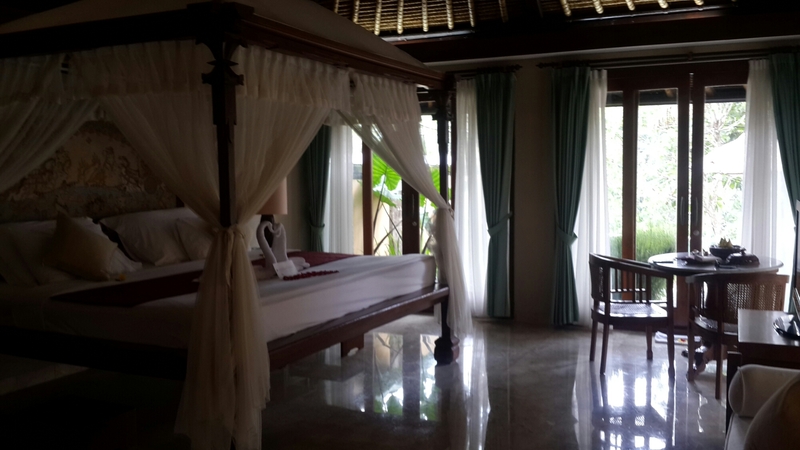 In the end we choose the Kamandalu and were so happy with our choice. From the minute that we entered the grounds we knew it would be special. They first checked our taxi with a bomb detector before we could drive in through the big gates. Then once we were inside we were given a flower for our hair. 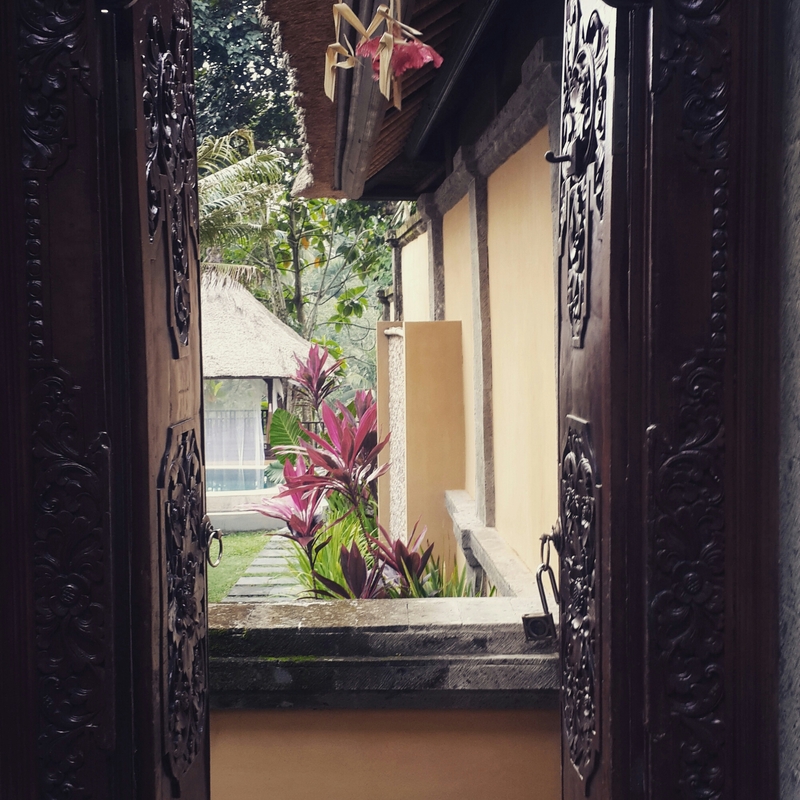 The Kamandalu has many different types of rooms to chose from, we choose the Private Pool Villa and found out that it gave us extra privileges so when we arrived at the resort we were ushered down away from reception to our own private check in area, complete with tea, coffee, canapes and cakes. They also informed us that we would also have a butler, free afternoon tea every day, 2 free cocktails every evening and money off of all of their restaurants and activities. 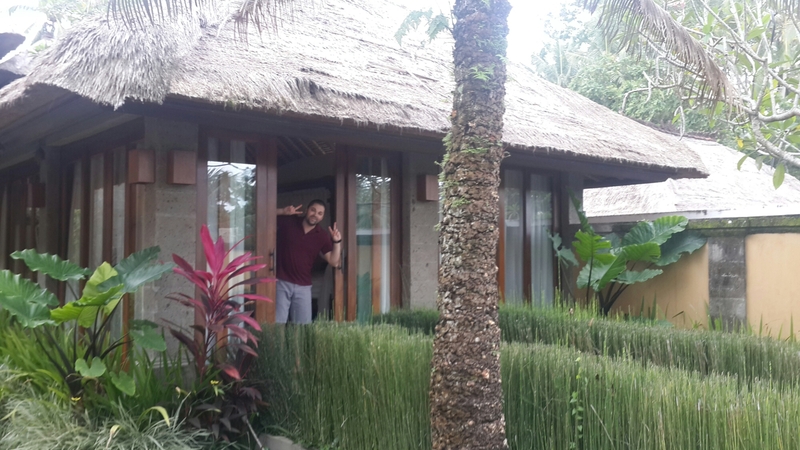 Once check in was finished it was time to go to our villas. The villas all have their own front gates and are very private. Once we walked in our gate I think we both wanted to squeal. 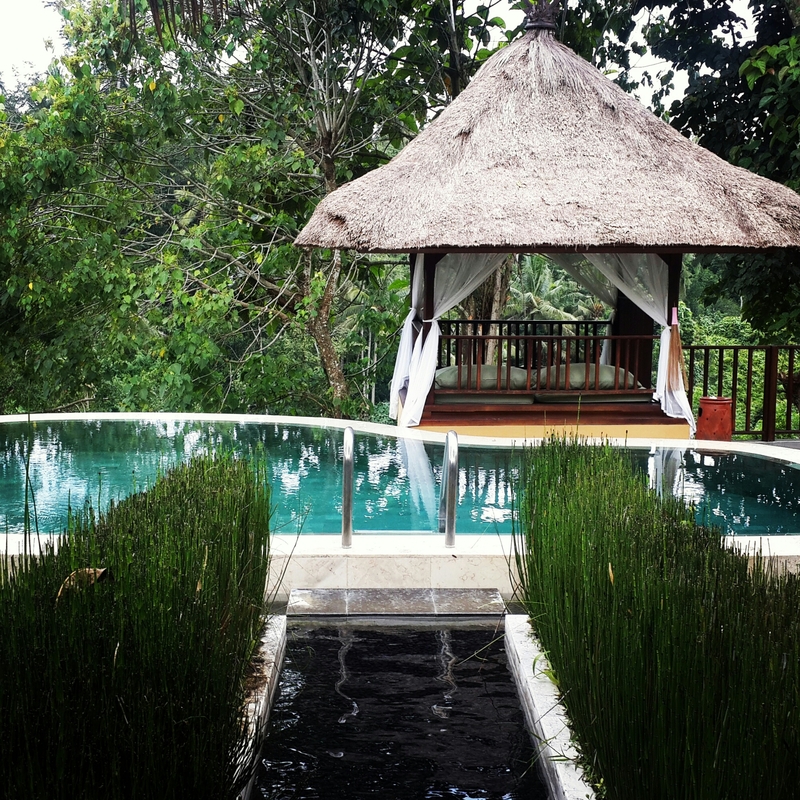 We had a beautiful garden area with the most amazing infinity pool overlooking the jungle and next to it sat a beautiful day bed. Inside in our villa we were equally impressed, our bed was huge! They had also laid out rose petals in our names. 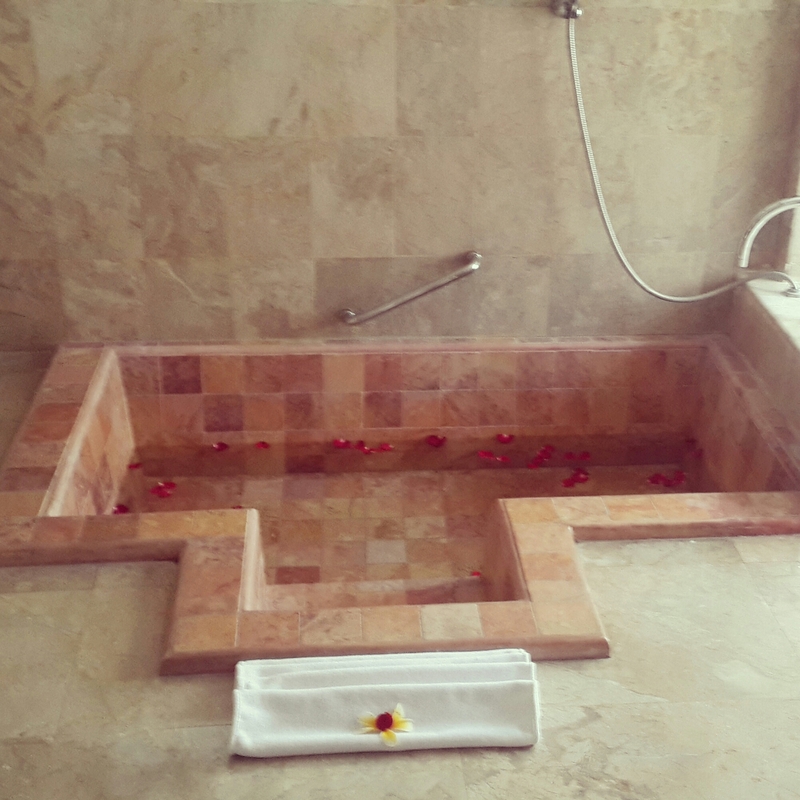 The bath tub was already full for us and had rose petals in it also. 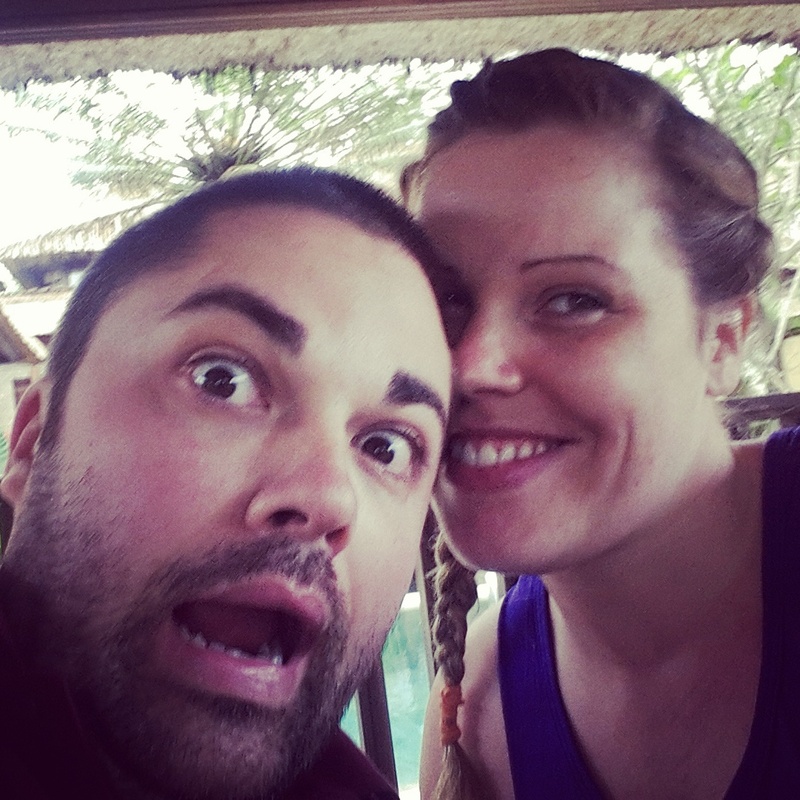 We had a beautiful outdoor rainforest shower and a lovely honeymoon cake. Once we were alone we tried to let it all sink in. It was amazing! 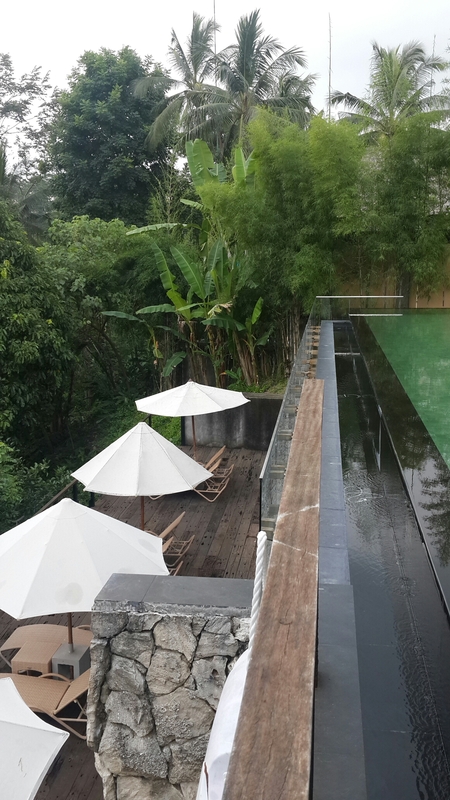 we went out to swim in the pool and saw some monkeys both on our roof and in the jungle. 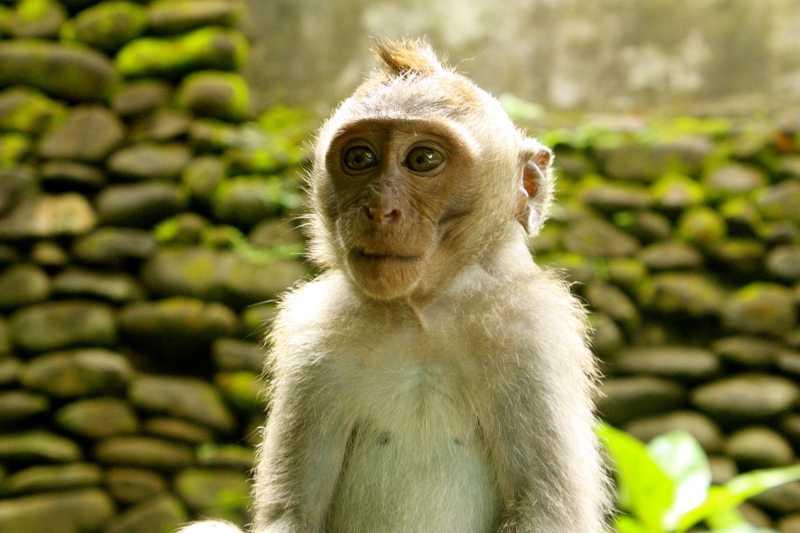 It was so amazing just spending our evening swimming and monkey watching. The next day was my birthday and we went up to the main building for breakfast. During breakfast the staff started singing happy birthday to me and presented me with a cake. Myself and Jason were both amazed because neither of us told them it was my birthday, they had seen it on my passport! 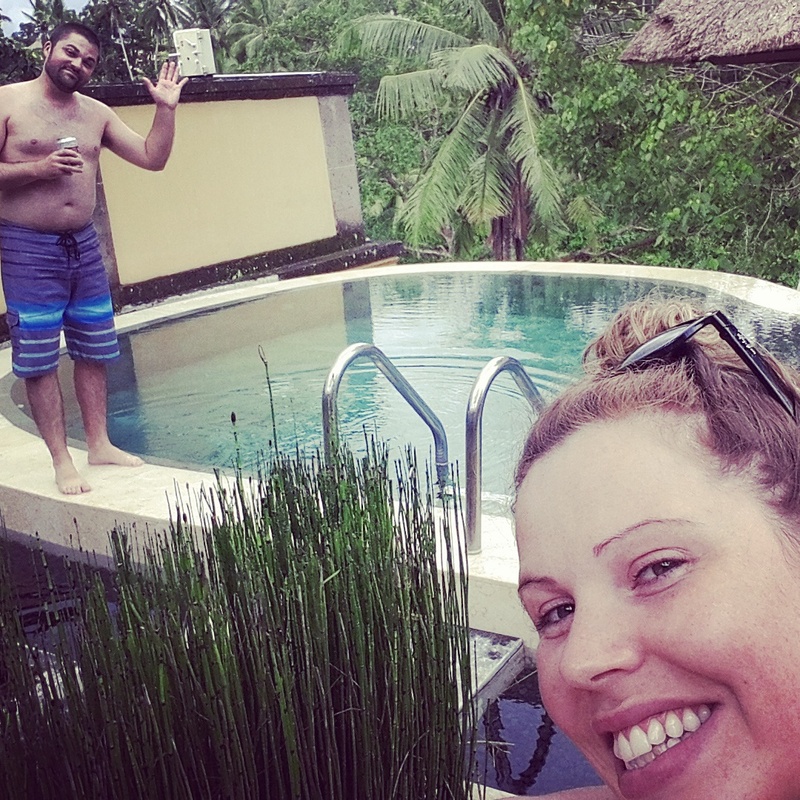 The rest of our time in the Kamandalu was spent like that, just full of smiles and little surprises. 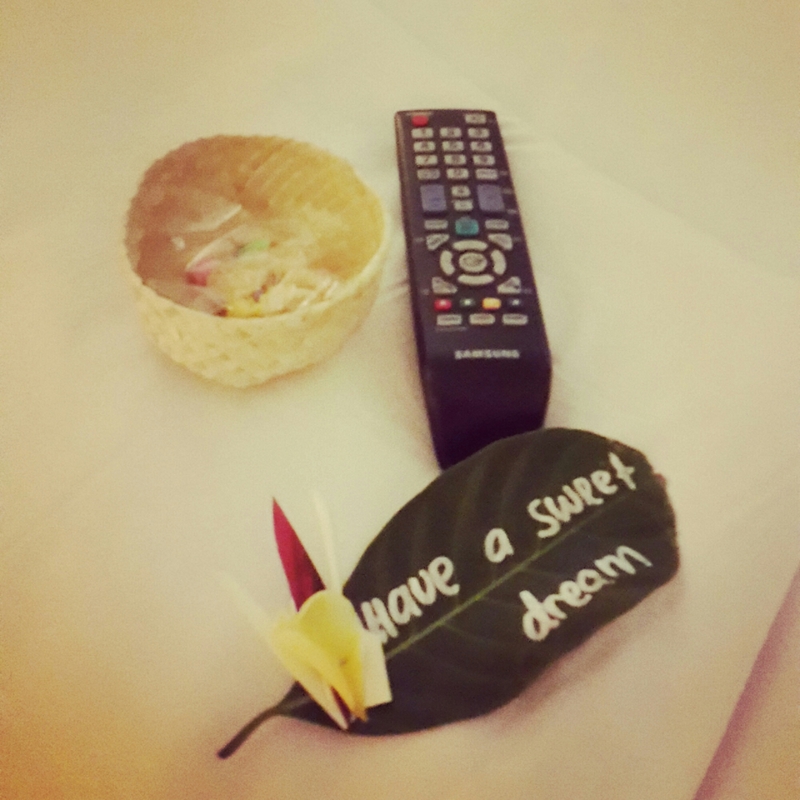 Our room got cleaned twice daily, in the morning and then in the evenings they would prepare our room for bed and leave us little gifts. 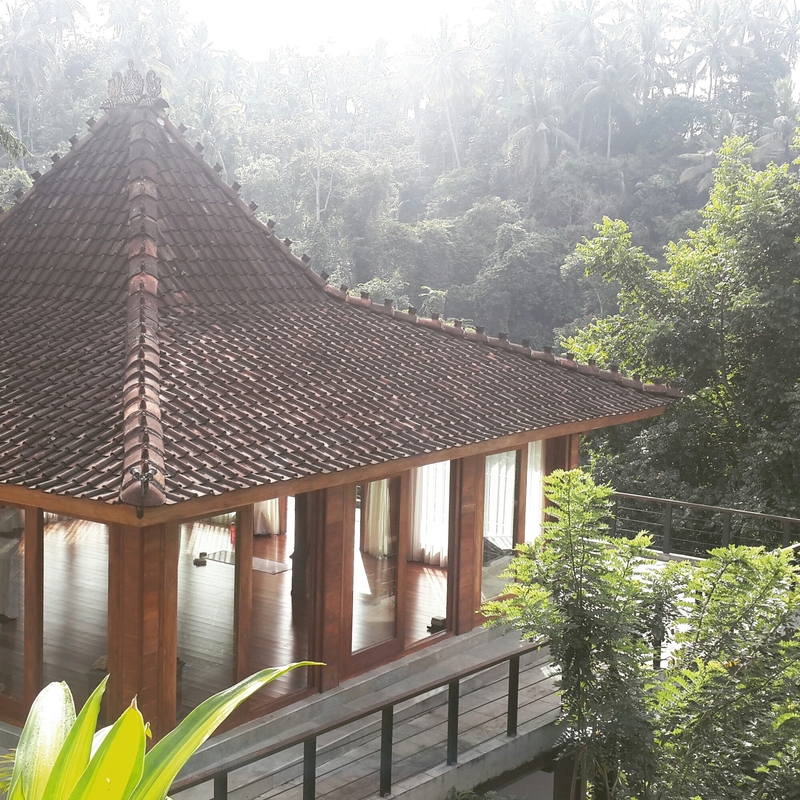 Oh and did I mention the free yoga in their beautiful yoga house? 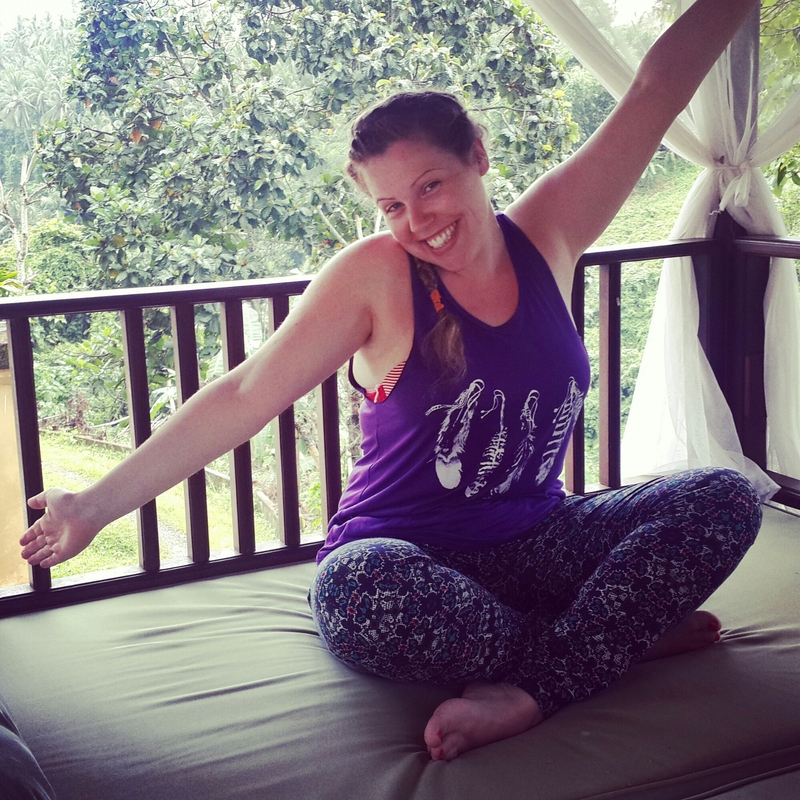 I went a couple of mornings and it was so wonderful doing yoga being completely surrounded by nature. 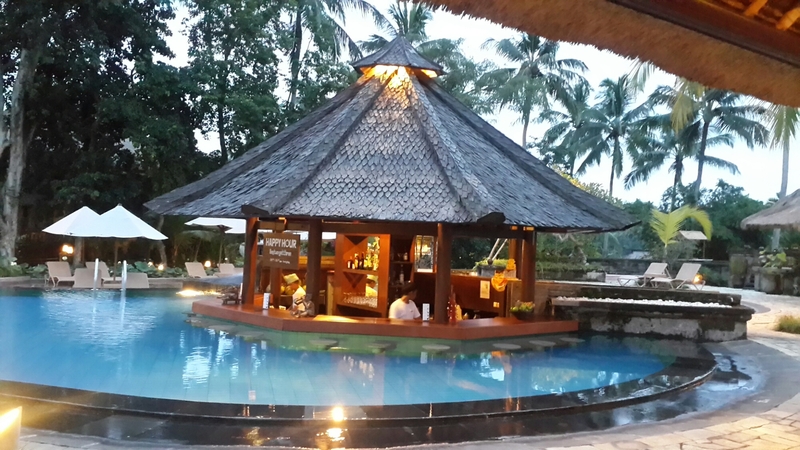 We also quite enjoyed their swim-up bar, especially during their happy hour! I apologise for the awful wonky photo! Details: You can visit their website here. and their trip advisor reviews here. 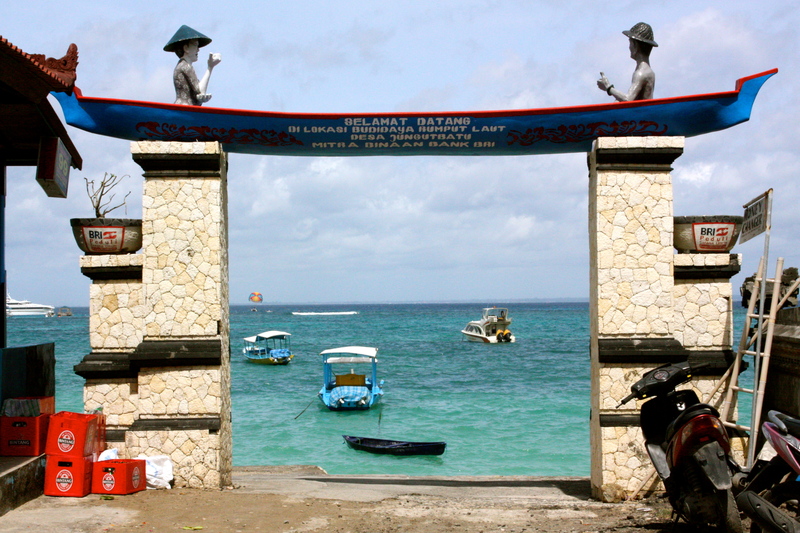 On our first full day on Nusa Lembongan we decided to rent a moped and see some of the sights…our first stop was to be Nusa Ceningan. 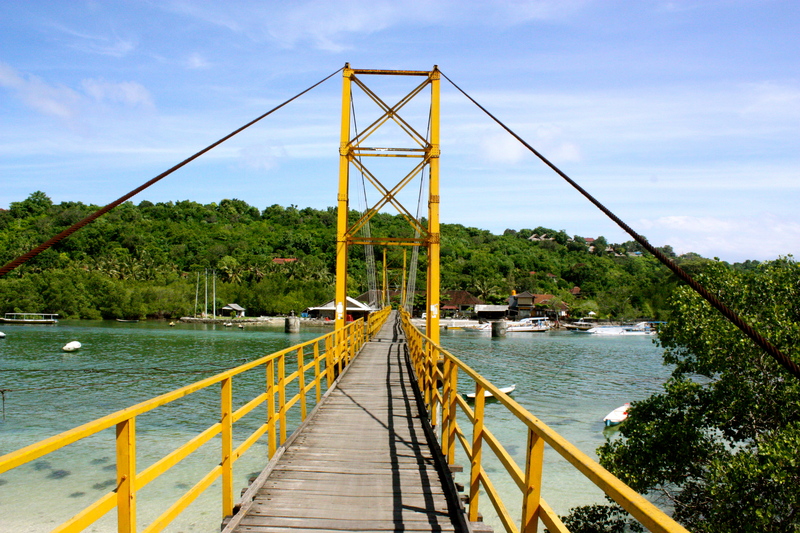 Nusa Ceningan is an island right next to Lembongan and is actually connected to Lembongan via a small yellow bridge. 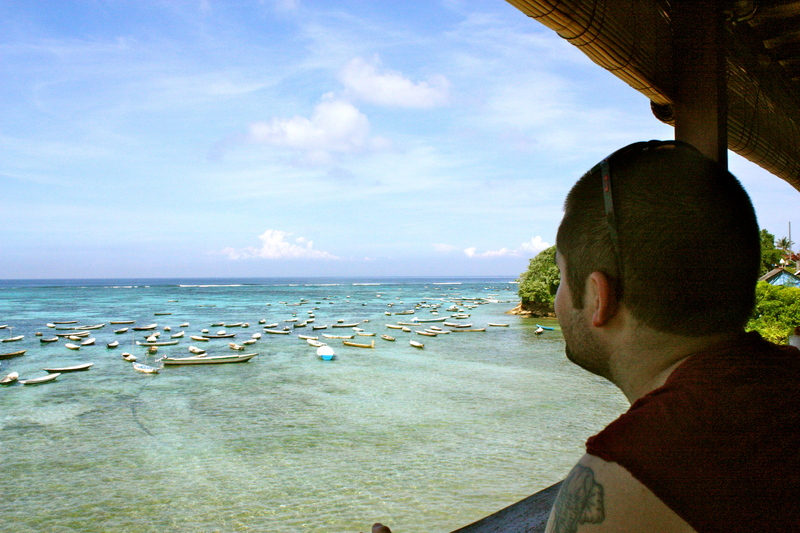 After our breakfast we headed out, on our way to Nusa Cenningan we found a little restaurant with the most incredible view. We could have sat there forever just taking in the views. Afterwards it was time to cross the yellow bridge. 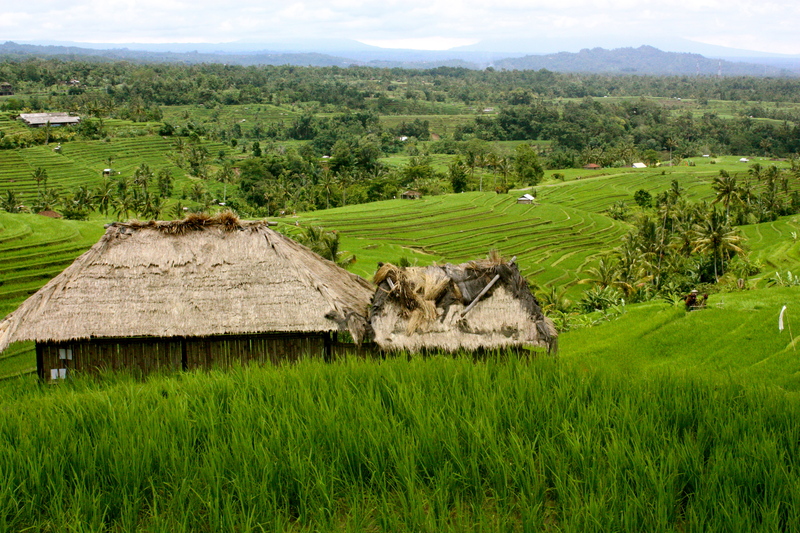 The roads on Ceningan are pretty bad but it’s pretty safe to drive there as the locals are used to all of the tourists on their bikes. Our first stop was at a random little hotel. 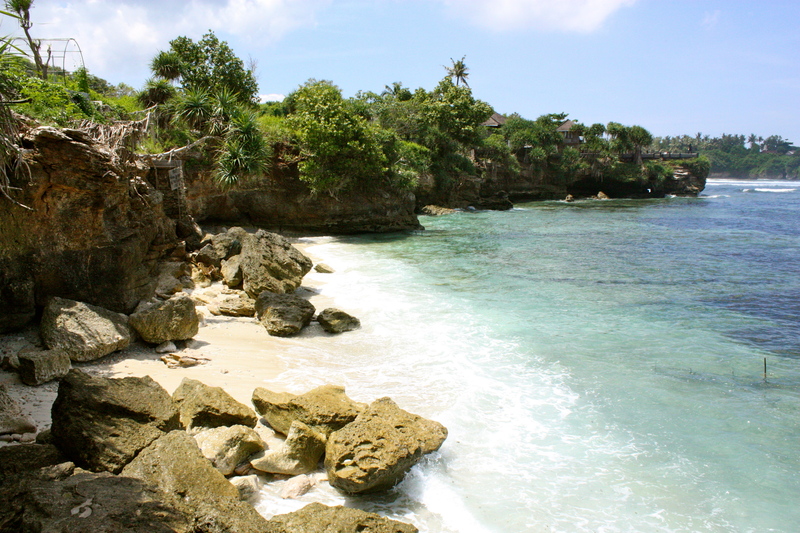 They had a beautiful view of the cliffs around Ceningan and we relaxed there with a bottle of water watching the surfers nearby. 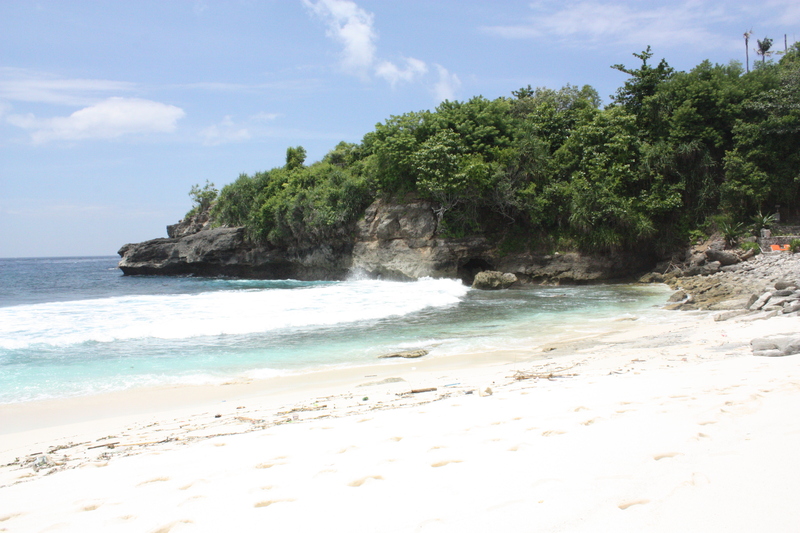 Afterwards we headed further in to the island to find our next stop…secret beach, next to Villa Trevally. We were initially going to book in to this resort but decided to was too far away. 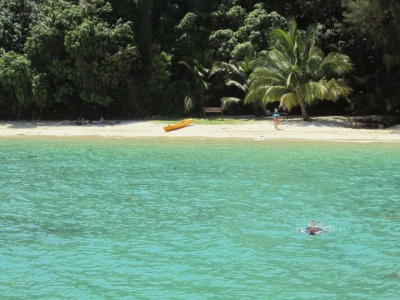 Once we arrived we had a tiny bit of regret because the beach is absolutely amazing. Unfortunately the currents and waves were pretty strong so we didn’t dare go in any deeper than our knees but it was nice being the only people on the beach. Afterwards we wanted to go to see the Blue Lagoon. 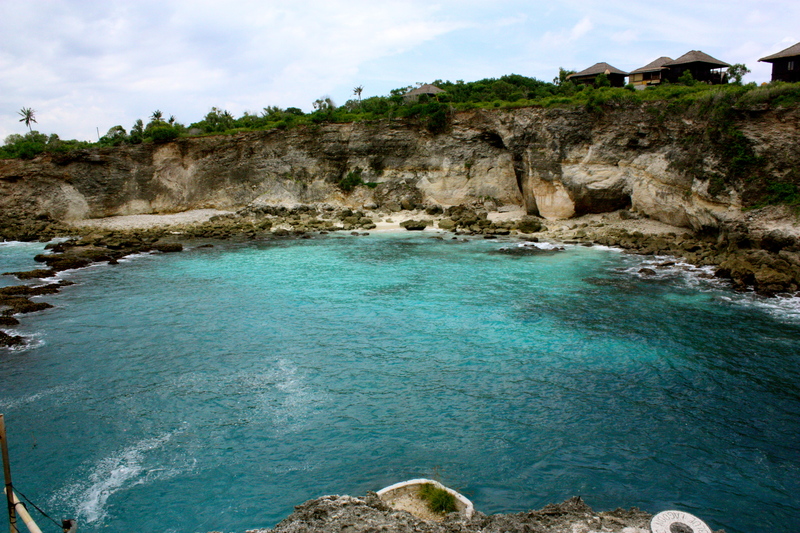 This is famous for people that want to cliff jump in the area. 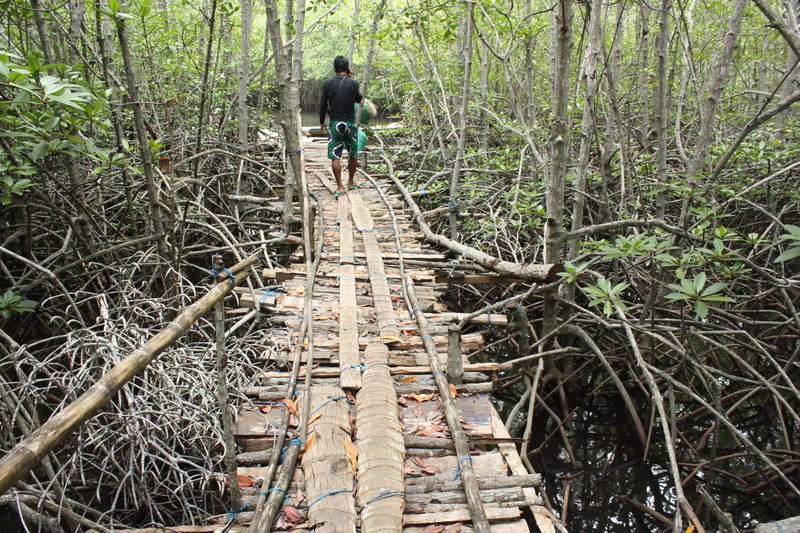 It was a pretty bumpy road to get there but it was worth it when we did arrive. Once again, like most places, we were the only people there (travelling during the rainy season really has its benefits!) Clouds were starting to roll in and the jumping was closed for the day because the sea was pretty rough (not that I’d do it anyway). But it was a beautiful area all the same. 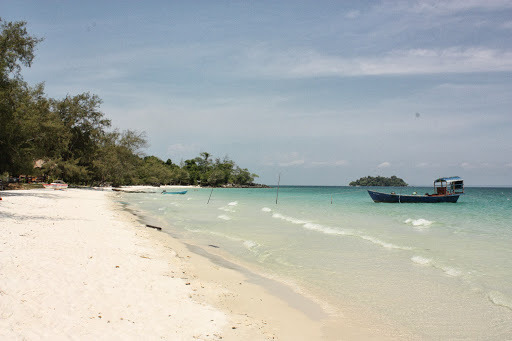 We had planned on visiting a couple of other beaches that day and driving through the jungle but the clouds were getting darker by the second so we decided that it would probably be best to head back. We got back to our room just in time to watch the afternoon shower and be thankful that we weren’t stuck in it. We also couldn’t believe that we managed to get so much done before lunch time, we were back in our room before 2! 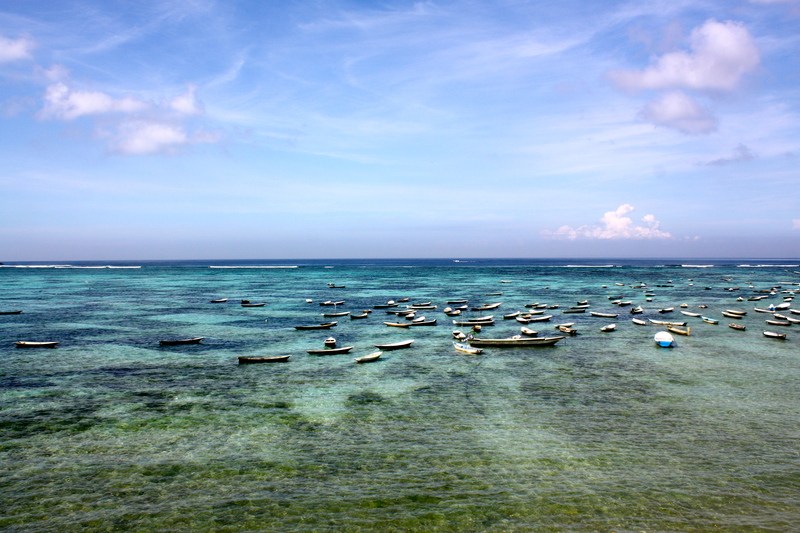 Nusa Ceningan is such a beautiful island and if you do make it to Lembongan I’d definitely recommend renting a bike and making the drive over to it. Renting a bike: We rented our bike from our guesthouse (nearly all guesthouses have bikes for rent.) They were really great and when we wanted to fill it up, one of the workers took it for us instead because it would be cheaper. He didn’t even charge us for the petrol! I think it cost about $8 a day to rent. 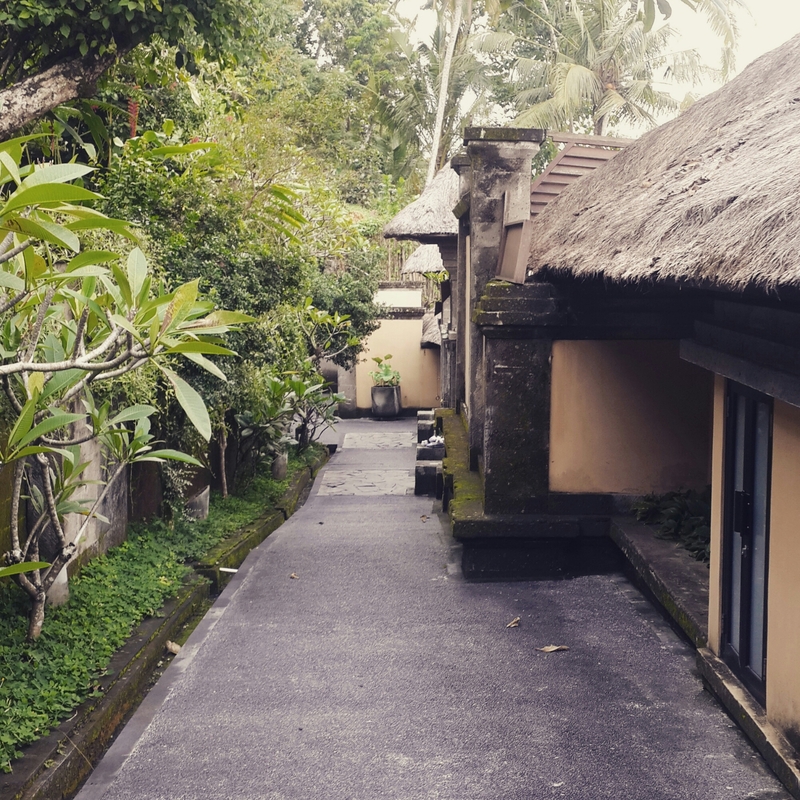 Where we stayed: We stayed in Cassava bungalows. They are a lovely small complex, with beautiful rooms and a nice swimming pool. The staff are absolutely amazing and so friendly too! You can see their trip advisor reviews here.